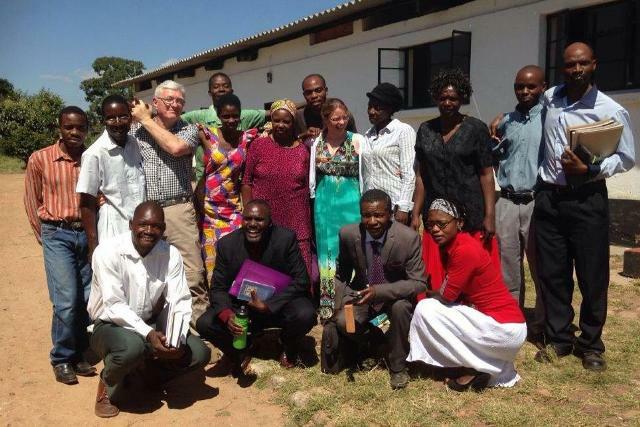 Our friends John and Celia Valentine live in Zimbabwe, Africa and operate a farm there and Bible college there. The work is a blessing to many and has helped to raise up many men and women to be ministers of the gospel in Zimbabwe and other places. They used to send out regular updates several times a month, describing the joys and heartaches of life there. Now you can see current updates on there Facebook page. Click on the Facebook logo for current Ameva updates! I am happy to post these updates and photos from 2006 to September, 2016 for all to see. The updates are posted with the most recent shown first. Updates before 2011 were shown in the Resurrection Life Church website before it was revised by them. Those past updates are now available in the Resurrection Life Church Chronicles pages of my website. Click on the links below. Grace has been following up the case to the mentally ill woman & her baby mentioned last week. The mother had been admitted in Kadoma Hospital after electrocuting herself (climbing a pole). The police & welfare officer took custody of the child & also left him at the hospital. The mother was transferred to the only psychiatric ward in the province at Chinhoyi about 90 miles (140km) away. When Grace took some clothes for the baby she was told that the child had also been transferred to Chinhoyi hospital but was assured that the welfare department & the hospital were very aware of the situation. All hospitals here are experiencing some challenges especially with drugs, so please pray the woman will get the right treatment. Meanwhile the police are trying to trace her 3 year old – the woman may have a family somewhere. We don’t know. John has been very busy sorting out the water for the big conference on the farm this weekend. We eventually got a rig to flush & line the main borehole. New pipes have been laid up to & around the farm & all the houses are now connected again & bathrooms refurbished. The CMC church paid US$2000 towards the expense. John is preaching at the Conference tomorrow. There have been more demonstrations in Harare with violence on all sides. A state of emergency has now been declared there & all demonstrations banned for several weeks. There are lots of beggars on the streets of Harare. Every traffic light has them. I make a policy of not encouraging them but John is not so hard-hearted. On a visit to the capital on Thursday I was for the first time aware that many of these were many blind people with children leading them. Our daughter Grace has a business delivering pies round Kadoma & Chegutu. At the “bus stop” (transit area) in Kadoma she notice a woman with obvious mental health problems with a 6 month old baby. The child had diarrhoea & was obviously neglected. A day later she saw the child left unattended for half an hour. She made enquires & eventually the mother came back. Later that week she was told the mother had gone to Chegutu climbed a pole & electrocuted herself. One of the blind beggars, who works the buses, said she had agreed to take the child. I checked the hospital & police in Chegutu but could find no records. Other things this blind person said didn’t add up. Grace has since got the welfare & the police involved. The sick woman has not been found & she apparently has a 3 year old child who hasn’t been seen either. We are hoping that this baby can be taken into care at the local orphanage that Grace & other ladies in the church support. Please pray. Terry will still send out the emails but if you no longer wish to receive the email, you can unsubscribe at the bottom of this or any Weekly. We had a wonderful Ladies’ Conference at Ameva with many more women than usual, even some from other churches. Despite everything they were rejoicing & praising & enjoying fellowship. My Shona still isn’t too good (shame on me) but the time I spent with them was so uplifting & they showed me so much love. 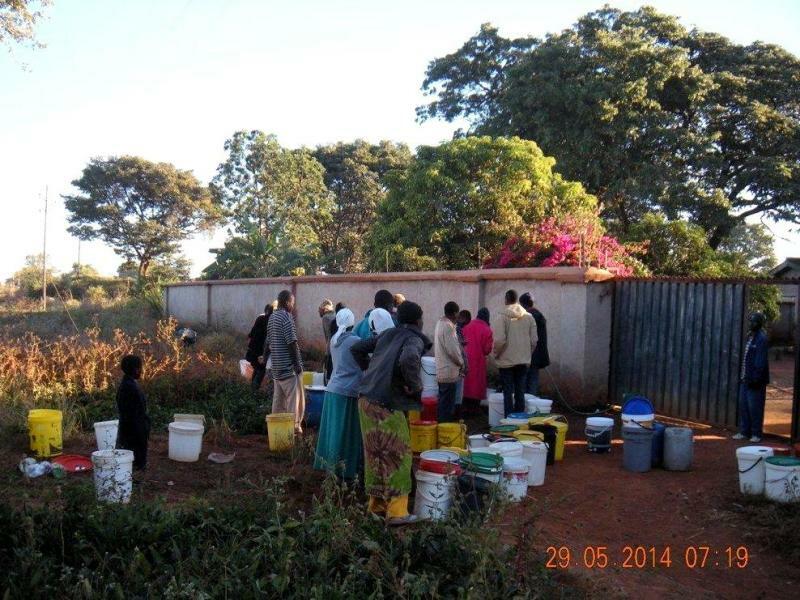 Work continues on water supply on the farm although the borehole people have yet to show up. The Archbishop has decided to postpone the 60 year celebration of the Christian Marching Church until next year but there will still be a Ladies Conference early September with about 500 so all the effort will not be in vain. No news on the brick makers. The local Environmental people keep saying they are too busy. We will have to take it to Harare if this continues. It’s just after 8am here & John has already gone up to the farm. At the beginning of September the Christian Marching Church, the church we work with, are holding their diamond jubilee – on the farm. About 1000 people! It’s all systems go to get thing ready but the main thing is to get the water sorted. John was in Harare yesterday getting the necessary to refurbish the borehole & connecting pipes. The borehole will be flushed out & new liners put in on Saturday; then a new pipe laid up to Bible College – an expensive job but the church has given us money. The celebration will stretch Ameva resources to the limit but in the present political climate it will be good to show Who is behind us. On the next door farm the Municipality have sold stands & are now putting in the services. The result is that we have been invaded by brick makers. One feels sorry for them because they are just trying to make a (hard) living in the harsh economic situation but on the other hand they are causing untold environmental damage. We have contacted the environmental agencies but they say they are too busy. We have contacted the police – they say it will be a jail sentence for some, which we wouldn’t like. If we manage to move these people it is likely that all our grazing will be burnt off. It’s a no win situation. Please see my FaceBook page ‘Celia Valentine’ or Instagram ‘ameva_weekly’ for photos. Tomorrow we say good-bye to Bryn. It has been great having him – teaching in the Bible College, preaching in the church, & working on the electrics in the Secondary School. We will also be missing Paul & Lesley going to UK for a break. Lesley has been quite ill & is already in UK having some medical tests to find out what is wrong. Please remember her. 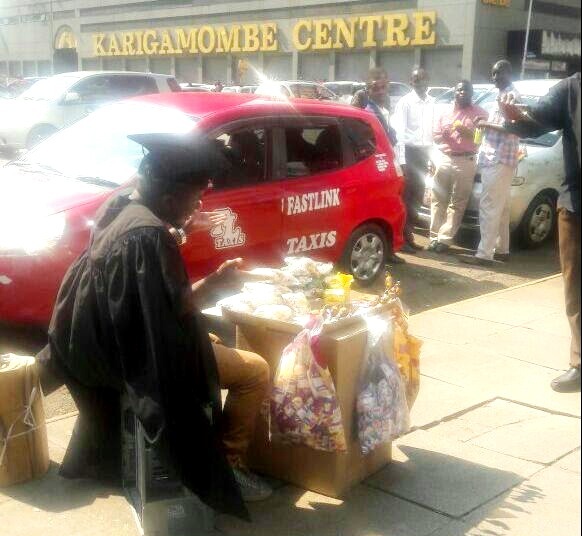 I have attached a photo of a graduate vendor in Harare – no jobs even for graduates. 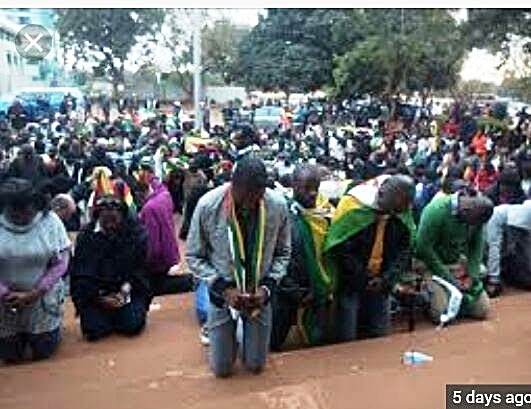 I attach a photo taken last week of people praying for the nation outside the Harare Magistrates’ Court. The situation is quiet but so far the army, police & civil servants have not been paid on time. We have had a quiet week in Chegutu but there have been things happening in Harare. In Tuesday Pastor Evans Mawarire, who has been encouraging peaceful stay-aways as a means of protesting against corruption & the state of the economy; (hashtag:ThisFlag) was arrested & charged with sedition (death penalty). Wednesday : over 100 lawyers volunteered to defend him in court & 2000 gathered outside the court to sing & pray. The police stood by with water cans & rifles, & armed police even entered the court room for a time. After some hours deliberation, the magistrate released Pastor Makorie. Great jubilation. Today the Harare street vendors protested outside City Hall but were dispersed by riot police. We wonder what will happen at the end of the month if the Government doesn’t have money to pay wages & the banks have no cash on hand. Please pray that God will raise up righteous/honest men to lead this country. Thanks for the birthday wishes. You may know that the whole country took a day off to celebrate. Well, not quite. Last Friday there was serious disruption at Beitbridge with cross- border vendors having a running battle with police & subsequently firing the custom’s warehouse. This was because of the introduction of import bans. The border with South Africa was closed for 6 hours. On Monday there was more confrontation with kombi drivers closing one of the main roads out of Harare in protest at the police road blocks & spot fines. Finally on Wednesday there was a general strike. Health workers, teachers & civil servants have not been paid last month’s salaries, those who have been paid can’t get their money out of the bank, corruption goes unchecked, motorists are harried by police, people have had enough. All was quiet in Chegutu. All shops closed in the morning but banks open & the larger supermarkets opened in the afternoon. There are more demonstrations planned but I am not allowed to talk about them. All pictures of demonstrations on social media have been forbidden. There has been some evidence that the Government tried to shut down Facebook & WhatsApp but they are denying this. Bible College starts next week. Bryn Vaughan is arriving today to teach. & we will collect him from Harare tomorrow. The British vote to leave the EU has caused a lot of panic & uncertainty. In Zimbabwe we have had 16 years of economic chaos starting with the land reform programme. We have seen hype-inflation at an unprecedented scale, collapse of the currency, collapse of banks (we lost money in 3), closure of businesses, 90% of the population unemployed, corruption as an everyday experience, lack of cash & now the poor sterling exchange rate. Because Zimbabwe uses the US dollar, people have been taking their money out of the country & with no exports this has meant a shortage of cash. Last month the Government announced that they were introducing bond notes. With memories of trillion dollar bearer cheques, no one wants these. People are not banking their US. In Chegutu we have been able to get $200 a day out of the ATM. In Kadoma the Barclays ATM wasn’t even showing that you could withdraw & I had to stand in a queue while we waited for money to be paid in. I was allowed $500 for the week. Most bills now paid by bank transfers but very difficult if you have to pay wages. In Harare the situation is worse & will get worse. Anyway what am trying to say is that nevertheless life goes on & God is faithful. We are told that there will be a time that “men’s hearts will fail them for fear” but we are “in patience to possess our souls” (Luke 21). Folks at our multi-racial Bible study on Tuesday reckoned, in this Zimbabweans had a head start on a lot of the world! The Referendum outcome is world news – not much else on the BBC at the moment. We have over the years sent many African carvings over the years as gifts & for sale. Nearly all of these have been done by Ben, a member of our church. He is really a gifted artist but for the last few years his business has been poor because of lack of tourists in this country. He started to travel to Botswana to sell & have several outlets. However, since he had no proper passport & the Botswana government were no longer accepting emergency travel documents, he was in dire straits. Earlier this year, however, he got an order from a church in UK for a Nativity Scene & it provided the money for the necessary document. This did not prove to be straight forward. 1.In Harare he was told that his birth certificate was hand written & he must get verification from the register in his place of birth, the other side of the country. 2. In Gutu the number in the register was not the same as on his birth certificate – took time to find entry. 3. Back to Harare & issued with a new computerized birth certificate. When he got home, he found it said female on the birth certificate. Back to Harare to get it changed & pay again. Another order from the same church supplied necessary extra funds. 4. Applied for new passport, told to come back in 6 weeks but when he went it was not ready. 5. After 8 weeks passport finally ready – great rejoicing & he came to our house to show us the precious document. Will be going to Botswana next month when carvings completed. The whole cost over $200 & many days travel on local combis & hours waiting in queues. I attended 2 Sports Days today – primary & secondary. The Secondary was in town & split over three schools. I only managed to get to Chegutu High School to see the senior football & netballers. Missed the junior teams & the volleyball. All the local secondary schools had met to compete for a place in the regional/national competitions. Shepherd our head master had been telling me that recently there had been a lot of rowdy & drunken behaviour at these gatherings where unemployed youth congregate. I didn’t see anything like that but apparently there has even been some cases of drugs (coming in from Zambia)being sold to the children by these guys. Fortunately Ameva is 5 miles from the town but do pray that we are not “infected”. Next I was at Ameva – play had not started since they were waiting for schools. Unfortunately, only one turned up since it emerged that the other rural primary schools had not managed to pay the affiliation fee. I took some photos which you can see on the usual sites. The footballers in the primary school are disadvantaged since they do not have football boots. Some manage to borrow but others play in bare feet. If anyone has second-hand football boots sizes 3-6 (mostly 4s & 5s) would be grateful is you can send them to us. Post to: The Head, Ameva Primary School, Box 173, Chegutu, Zimbabwe. Gmail have failed to deliver our email this week to most on our mailing list so we have change the way we send it to you. It may be that you have received this weeks news already so sorry to repeat it. We had a restful few days break in Nata, Botswana. Because of late rains the flamingos had not arrived but we saw pelicans & many other birds. Had intended to spend a couple of days in Bulawayo but it was so cold we came home early. Snow fell in Gweru on Friday – the first in living memory & in met records. This week has been stressful because of the cash shortage. Most of the bills had to be done by bank transfers (which is expensive) & our daughter Grace, who has a shop, helped us with cash for the farm wages. I do worry as we carry quite a load & it is difficult to say no when things here are so desperate. Silly really because the Lord always provides. I realise you do like photos & I opened a Facebook page with this in mind but Ros Taylor told me that Instagram would be the way forward. I have put a few photos on the site & hope to do so week-by-week. Just a few notes for prayer. 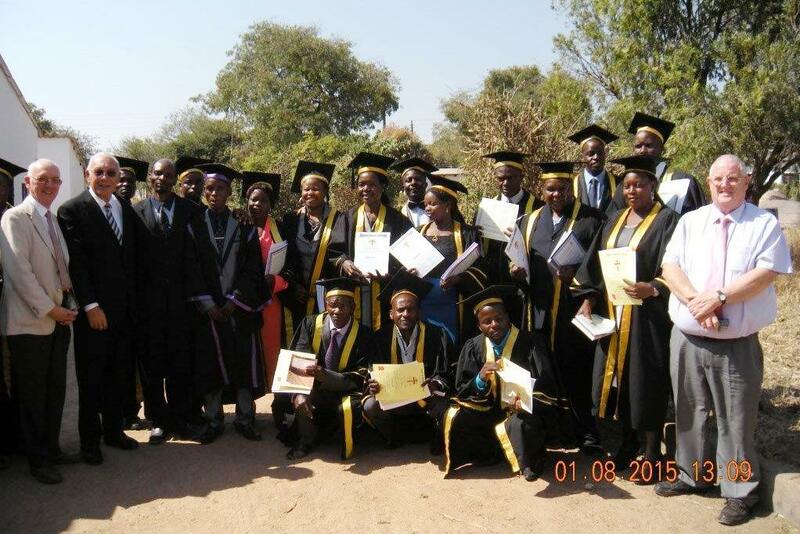 15 Students from Bible College extension under Paul Evans will be graduating on Saturday 14th May. There is a cash shortage & the Government intend to start printing money again – not a popular move. The economic situation continues to deteriorate. This is what Mrs Magaya wrote on the Ameva Alumni site. Others agreed & we were so thrilled. This year there was wonderful harmony & no grumbling. Those attending firmly stood for “the true sound doctrine of the Word of God” as one pastor put it. The “prosperity gospel” was totally rejected despite the fact that many have lost people from their congregations to these churches. It is a great encouragement to see these dear men & women persevering despite difficulties & to give them a time of encouragement, fellowship & refreshment. Special thanks to Terry Murray visiting from Australia who did many, many mile driving up & down to the farm on a terrible road. We couldn’t have managed without his help! Hi. Another photo of our present certificate students, Ameva Bible College, complete with their present lecturers - John Murphy & Sarah Kingston from Tralee, Eire , Pastor Eb & Solomon. Sarah is our first female lecturer & was a great success. Please pray for the Pastors Conference Monday to Friday next week. Times are tough & we are praying that travel expenses will not put people off coming. 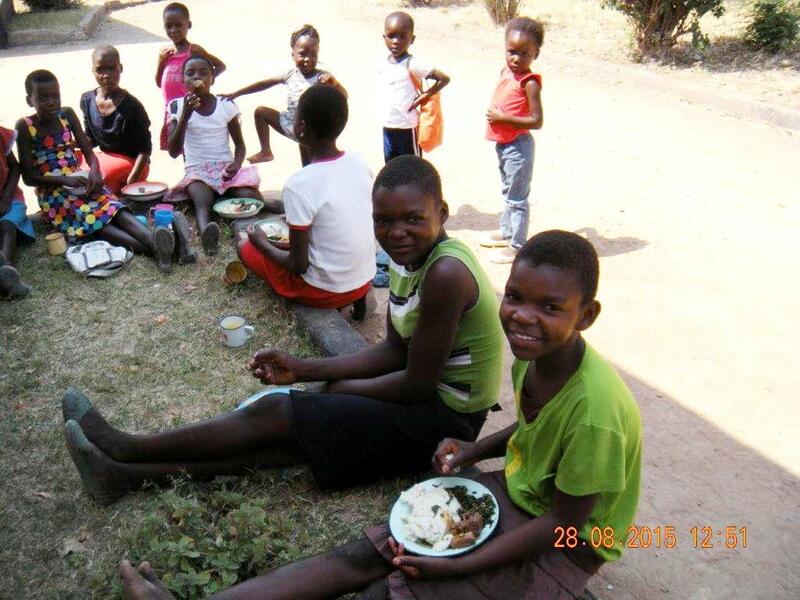 I thought you might like to see some photos of the holiday feeding scheme. I took these on Monday. About 98 children came. Mostly smaller children from the surrounding farms but even so some are walking three miles. There is also a class of older children who are sitting secondary school entry exams in November & are taking extra lessons. Some of these children live over five miles away & also have to walk to the school. You will see the teacher in a red jacket who is teaching them. Mrs Jabangwe, the head, is also there. 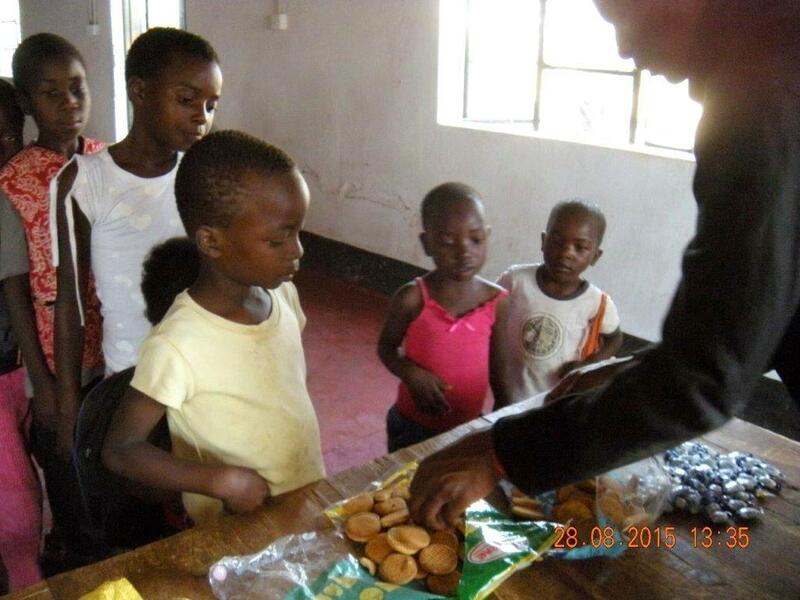 She is giving out biscuits kindly donated by a friend in Harare. Also (with her back to us) Mrs Dopora, the pastor’s wife & school bursar, & Mrs Pamela (in a brown cardigan) school assistant. We are grateful for friends in Cyprus & other countries for helping us provide this programme & to extend it into the holidays. The Bible College is going well & we have quite a few new students. Last weekend we had a quick visit to Botswana with Grace & Daniel – we - to visit the bank & Grace - to do shopping for her corner shop. It was a long journey but nice to spend time together. The economic situation here continues to be difficult. Last month a pastor, a graduate of Ameva Bible College, came to our gate. His church is very poor & he sells pies to keep his family. However, because of the economy, his sales had been bad & his family had not eaten anything substantial for three days. He has three children; the baby is disabled. We were able to give him a large bag of maize meal (mealie meal) but how many more like him? The price of 50kg mealie meal has gone down two dollars but likely to increase and we have been out sourcing more. We now have quite a store in our garage thanks to your prayers & gifts. Bible College starts on Monday. John Murphy & Sarah Kingston from Tralee arrive tomorrow. We are not expecting to be in UK this year but hope to visit Israel with Les & Vicki in September. Some of our family may come as well. Good Friday is a public holiday here. It is a traditions with some churches to walk slowly round the town singing Shona hymns – it’s very moving to see & hear them. Yesterday our electricity was out the whole day so we were able to hear the singing clearly in the quiet atmosphere. So much is going wrong in this country as elsewhere. The news is not good & the world seems a dangerous place BUT we have an anchor…..May you know peace & blessing this Easter. On Wednesday we had another downpour in Chegutu town but especially on the farm. Our dam is now 80%. Someone travelling back that day to Ruwa, which is passed Harare, said it was dry once they left Chegutu. We got an extra blessing that day! However, although there was little rain in February, the crops on the way to Harare have revived somewhat with this late rain so there still be a harvest in the area but with a reduced yield. Thank you for the prayers. The schools break up for Easter on Wednesday. 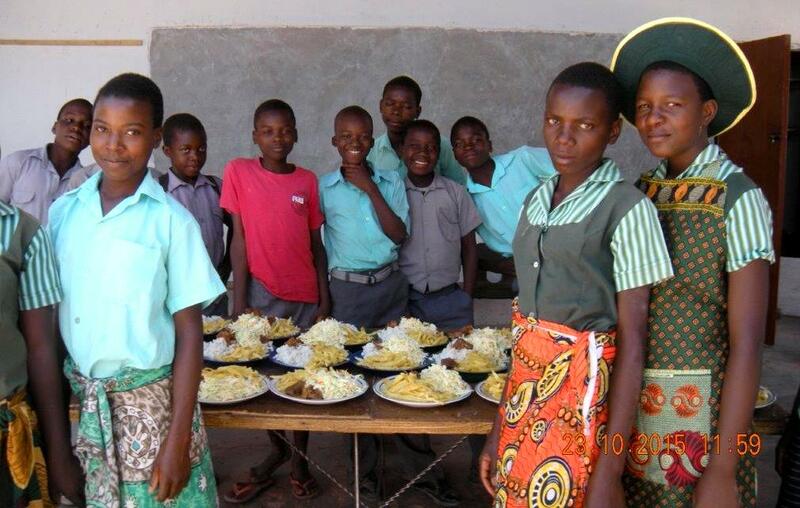 We are planning to continue the feeding scheme during the holidays thanks to some kind donations. And the church is having an Easter conference at the farm, starting on Thursday when the 3 congregations get together. It’s always a good time. The schools have started a good year with improved results in national exams in both the Primary & Secondary Schools. One boy got 8 ‘O’ Level passes, 5 of which were ‘A’s. Not bad for a farm school! We have also had several children get through to the provincial sports athletic competition. Altogether, they have done really well. The Secondary school has now introduced ‘A’ Levels to their syllabus. So far they have 8 students who are being taught by the current staff. The Head has partitioned off part of the school hall to make another classroom, although a further block is in the process of being built. Parents have done the work in lieu of school fees & all that remains is to put the roof on. So things are moving forward bit by bit & we are grateful for all the hard work & commitment that the heads & staff have shown in difficult circumstances! All are church goers & are in agreement with our creed, which is a great blessing. We had lovely rain on the farm last night & today & here is a picture I took this morning, through the rain, of our dairy herd enjoying their grub. The ever-present egrets are also enjoying insects & parasites. Other parts of the country have not been so fortunate & yesterday the papers said that so far over 20,000 cattle have died with possibly more in future weeks. Thank you for the prayers - this latest rain has really helped the crops in this area. People did not plant much this year but they are hopeful that now they will reap something. The food situation in the country continues to deteriorate. We have had a couple of children collapsing in the secondary school & one not able to walk to school as they only have vegetables at home. The Zambian & South African governments have now stopped export of maize to Zimbabwe since they are worried about feeding their own population. Last week we managed to get half a ton of mealie meal (maize meal) for our workers but it goes up in price every week in the shops. The company that sold us maheu for the feeding programme has been taken over & stopped production for the time being. 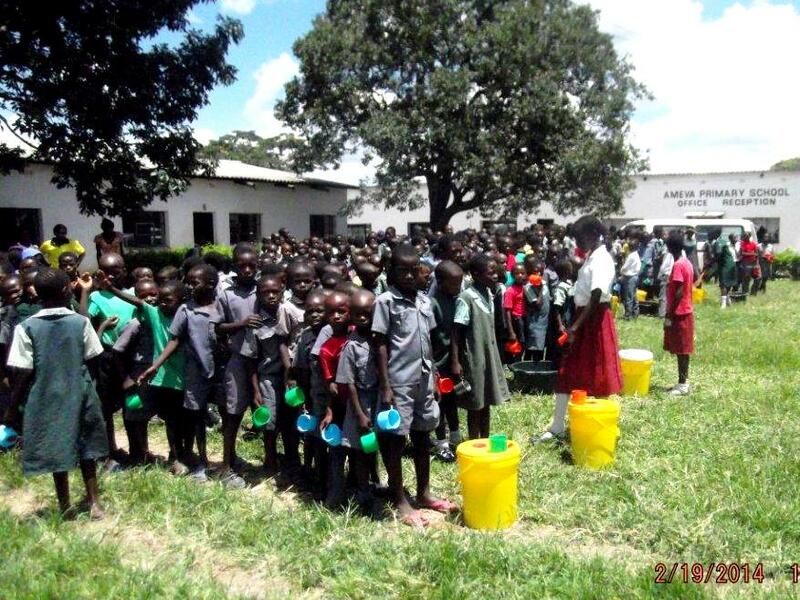 The schools were reduced to giving maheu to those most in need. However, on Wednesday we went round all the shops in Chegutu & bought up all the stock they had (80kg). We were able on Thursday to pick up 6 x 35kg bags from another firm in Harare. We are in an area that has had some rain (although not enough to grow crops) so other areas must be in a worse position. We have not had rain for 2 weeks, please continue to pray as we do need to keep the grass growing for the cattle. We have had some storms on the farm & despite the streams not running our dam is three quarters full! The President has declared a state of emergency & appealed for $1.5 billion food aid. We spent a pleasant couple of days with Paul & Lesley in Harare. They now have a residence permit for another year & are planning to expand the teaching project to other parts of the country. There are several nasty consequences of our economic problems One, which I have mentioned before, is the road blocks & police demands for money at any excuse. Another is the electricity black outs. Another is the late payment of the teachers & other civil servants, although the police & armed services do get paid on time. Last year we were supposed to be paid by the Government for gravel they had taken off the farm for road repair. Our quote was cut by half & when money was finally paid a further US$1000 had been creamed off resulting in very little remuneration. The Government have recently raised the age one can get married to 18, since so many teenagers were opting to marry for a better life. One of the girls at Ameva Secondary School truanted at the end of 2014. Her friend suggested that she had eloped. However, efforts of mother (father dead) & family persuaded her to return to school. She again disappeared at the end of 2015 & this time we heard that she had married a man currently working in South Africa. She still lives with her mother & since these itinerant workers often pick up nasty & very nasty diseases, at 16 Constance’s future does not look bright. I heard yesterday that another girl who was very clever & due to go up to the Secondary School from our Primary School has also got married. Raising the marriageable age to 18 doesn’t register on the ground that’s for sure. Would appreciate your prayers. Thankfully we can report that there has been very good rain this week & our dam is starting to fill. Still more needed to take us through the year. We are enjoying having our son, Niel, & wife, Janna, & daughter, Mia (20 months). Great to spend time with them, as even when we are in UK we only see them occasionally. They are here for 2 weeks. The school terms have started. The Primary school had lost 3 teachers to private school, which had opened at the platinum mine. We have 2 replacements & are waiting for a third but the parents are disappointed as the teachers were well liked. Please pray that everyone will fit in & work together. A boy (Form 1) in the secondary school attacked his friend (who ran away) & was later found unconscious. A group of teachers & Emmanuel from the farm, who happened to be delivering milk there, prayed for the lad. He eventually came round & started talking & was taken home. His brother says he is given to these episodes. He appears normal one minute, then violent & then unconscious. He belongs to the Apostorai sect that wear white robes. Please pray for his deliverance. Sorry for the silence but our internet was down for nearly a week. It was working well until the telephone people decided to do repairs on the line. Don Clark passed away two weeks ago. There was a private burial & a memorial service last Saturday. 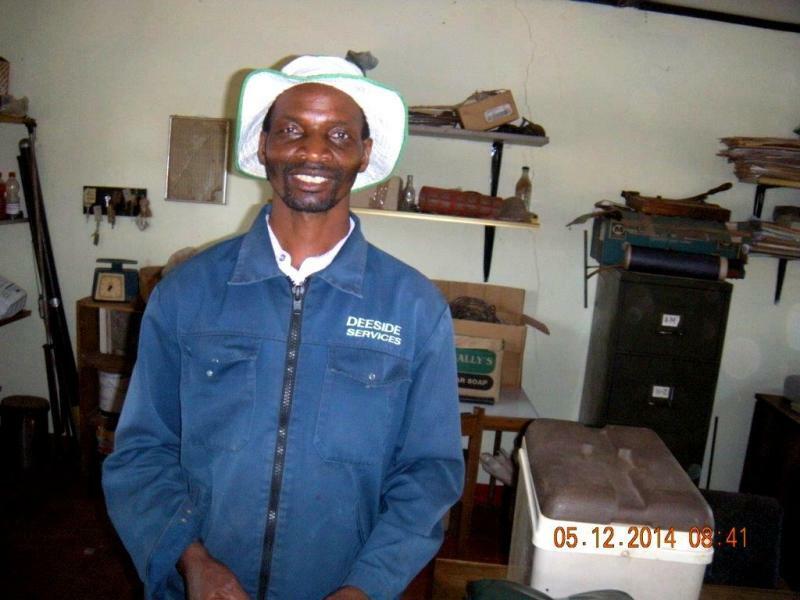 Sad to say good-bye – he seemed a fixture in Chegutu having lived here for over 50 years. He would have been 90 next month. We had some rain at the beginning of the month & are expecting more this coming week. 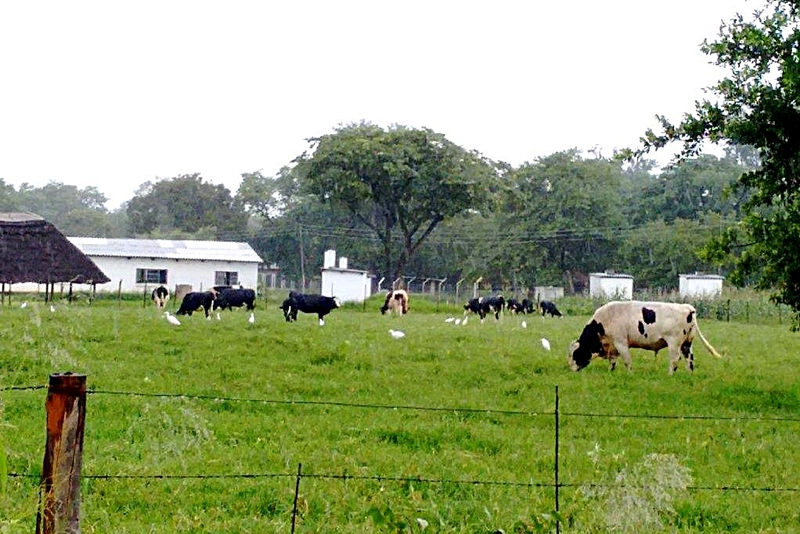 Our cattle are enjoying the grass. However, in other parts of the country the situation is dire. Over 7000 cattle died in Mutare area & we have heard of a prize Simmental herd having to be slaughtered in the south of the country. None of the crops are in good shape. The government have asked for prayer but the church leaders have said there must first be a turning from sin. We got our first load of maheu this year for the feeding programme. We are already going round the NGOs to source extra but as yet there is nothing donated. Still extremely hot & no rain since before Christmas. In South Africa they are starting to talk of the worst drought in 100 years. Next week the schools start after the long holiday so things are busy. Some of you who have been here will know Don Clark. He had a stroke several weeks ago but since just before Christmas he has been failing & is now not conscious. Please pray for the Lord to be merciful. Thank you so much for all the cards, emails, greetings, love & prayers sent to us. We have yet to sit down & read all the latest - but we will! We had a wonderful Christmas with our family - the overseas contingent returned last Monday (28th). Yesterday we had a lovely time with our friends Paul & Lesley (ex Aintree) & Eric & Ros (ex Bracknell). It's truly been a very happy time. 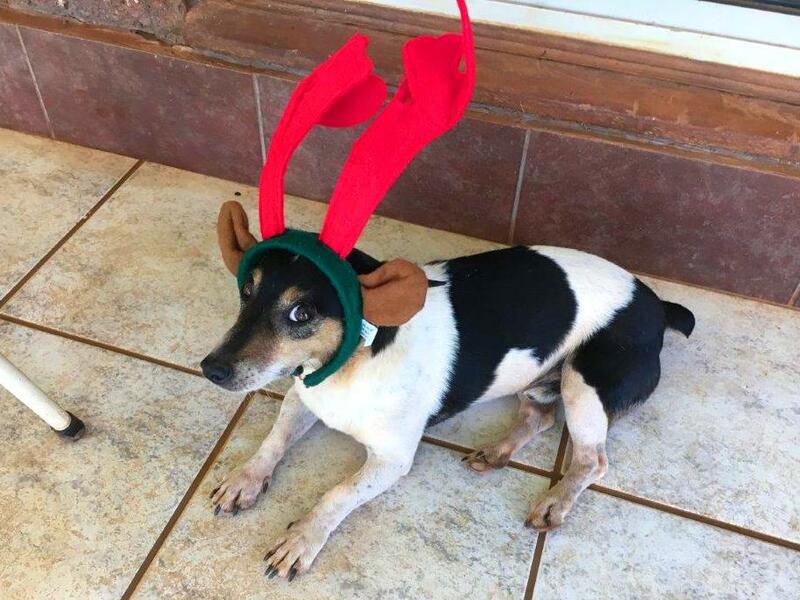 I am sending a picture of our Jackson getting into the holiday spirit. I think I should say that the photo shoot took less than 30 seconds to prevent psychological damage to Jackson & physical damage to our daughter Abigail. It’s that time again when we’ve had emails from many of you & learnt a little of your lives over the past year. John & I have just spent most of this morning reading these missives. We are amazed at so many friends! Thank you so much for all your love & help over the years. Ameva is truly a joint venture. We also have been reminded of our worldwide connection by the arrival of a little bird called the amur falcon. It breeds in Northern China & Mongolia & then flies thousands of miles over the sea to Southern Africa to avoid their cold winter. We have had wonderful rain the last few days, & these birds have had a feast of the flying ants. A flock rousts in the gum poles outside St Frances School in Chegutu. And yet all too soon they will be returning on their long journey. We have friends in China & friends in Mongolia – we are united in Spirit & united in these little birds. How wonderful it all is! Our children Abigail & Paul & my sister are with us & we will join with Grace, Bruce & Daniel on Christmas Day. A real family treat for us. God is good! Lots of comings & goings this last fortnight. We (me & my sister) were able to spend a lovely few days with Paul & Lesley in Harare. They are doing a great work there running a Saturday Bible College for those in church leadership who are working full time. Paul has major qualifications so as well as being a brilliant teacher, he gives kudos to the work. Lesley has been a great support to many African & European families in the community, & a kind hostess to many. Please pray for their visas which will shortly need renewing. Schools closed Thursday 3rd. John attended the Secondary School Prize Giving & Party on the Tuesday, while I collected my sister from Harare. The Ameva Bible College session finished on Friday 4th & Church Party was on 6th. Due to the economic situation there were only 7 students in the Bible College certificate course this time but quality made up for quantity & we hope Derek & Richard thought their visit worthwhile. They were a real encouragement to all. They left on Monday & daughter Abigail arrived the same afternoon. Our Paul arrives next Tuesday so we are looking forward to a family get together over Christmas. Still hot & no rain. Thank you for your prayers. We had some rain over last weekend in Chegutu but very little on Ameva Farm. It continues to be very hot & I am writing this in our hall – fortunately large & the coolest room in the house. We received a timely gift to buy cattle fodder & the cattle are very happy & asked us to give a big moo-moo to their benefactor. Please pray the rain will come soon as we cannot go on feeding them. Due to the economic restraints only 7 students turned up for the Bible College session certificate & 4 for the diploma course – but they are good men & women, so we are encouraged. Ardwell was buried in Harare on Monday. The social welfare refuse to help as he was already deceased when the family applied. In the end his younger brother signed to pay off the hospital debt monthly. Two carloads went from Ameva (but not us). A simple ceremony – his package from Ameva Secondary School where he worked paid for the transport etc. & his church, Chegutu Christian Fellowship, paid for the coffin. Pastor Ed made a speech telling all we had done for him over the years. Two of the brothers thanked us when they came to sort out his things; so I suppose that was something. I thought you might like to see the children in the Primary School having their Christmas party or rather celebrating the end of exams. Schools close at the beginning of December for the long holiday & open for the new school year in January. Teachers reported 100% attendance on Tuesday. It wasn't me that provided the rice & goodies but I go all the thanks. So many happy children waving & thanking me as I drove out. I think it was a better food & treats than most will get in their own families on Christmas Day. Look out for the Secondary School party next week. Derek & Richard from Birmingham are with us. The new Bible College session starts on Monday. We are sorry to let you know that Ardwell died on Thursday night. He never seemed to recover from the op on his leg & did not have the strength or will to fight. He was speaking when I saw him on Monday but not eating much. I assured him of everyone’s prayers & help. But on Wednesday he was on a drip & being given oxygen. We are all rather sad because he was part of Ameva. His family are now faced with a $3000 bill before they will release the body. Since they have done nothing for him in the last 20 years & especially while he has been in hospital, we decided that it is up to them to sort out. Hopefully the Social Welfare department will help but it’s not certain. Thank you for the prayers & help. He would not have lived the 20 years since his accident had it not been for friends of Ameva. So God was gracious. Hi. I’ve been to pay the electricity bill but their system was down because of the power cuts! You have to laugh. We didn’t have electricity in the day yesterday & we didn’t have electricity all today but on the whole we have done better than most. And it’s soooooo HOT. In fact we can’t remember it being so hot for so long day & night in the 100s/30+ I keep looking at the internet to see when it will rain but last week’s rain has become next week’s rain. Every time I look it is going to rain a day later than yesterday. Good news is that the wind has stopped & that is a welcome sign. After 2 years (much interrupted) work I finally managed to catalogue all the Bible College library books. It was a wonderful feeling going to the farm last week for one final check. However, half way through the printing, the photocopier malfunctioned but never mind it is now fixed. Now I have everything on paper we can open the library to local pastors & not just to the students. We have been promising to do this for so long – I don’t think they will believe us! Just like to say thank you to all those organisations who have faithfully sent books over the years – Langham Trust, Montgomery Book Depository, Grace Publications, Emmanuel Church, to name a few. We are very grateful. Last weekend was incredibly hot – in 40s. Now it is twenty degrees cooler. Very strange weather. No sign of rain but please keep praying. Because of the economic situation the butchers are not buying our beef & we have had no sales for over 3 months. Because there has been no rain we should be feeding the cows but we can only afford to feed the very thin. Rain is needed desperately. Ardwell is still in hospital & keeps phoning all & sundry to take him out. He has had the op on his bone but now needs skin grafts. And he has had to have two more units of blood which has meant we have now paid over US$1000. The teachers have had a collection & some money has come out of Ardwell’s wages at the school, but the bulk we have had to find from our resources. Shepherd, the headmaster, is trying to get a letter from the Social Welfare so that he will not be charged for treatment but we still have to pay for blood & eventually for drugs. Sick people be grateful you do not live here! Some good news. The church at the farm has been steadily growing. James & Eb have been doing some serious evangelism on the surrounding farms. Since there has been trouble in the ranks of the Apostorai (white robed sect) people have been open to the gospel. We have prayed for years that their power would be broken & this is a real break-through. Grace is now much better but still wearing a brace. She is not supposed to bend or lift for a couple of months. The electricity has still been bad on the farm & it has been difficult for them to pump water. Very hard when you are running schools & it is so hot. Yesterday a whirl-wind took the asbestos roof off Pastor Ebenezer’s house. It is a real mess & they had to spend the night in one of the Bible College buildings. The carpenter is taking to roof off another building to make his house live-able until we are able to repair properly. This has been a very expensive year for rooves on the farm! Another hot week. Strong winds blew the roof off one of the classrooms at the primary school & last week destroyed part of the roof at the pre-school building. Fortunately both incidents happened over weekends so no one was hurt. We have managed to repair the pre-school but the classroom roof is more extensive so we are still assessing the damage. In the meantime that class is meeting at the Bible College. Today we had the school AGM which went well & Grade 7 class had their leaving party. I attach a picture of the party & of Prosper, Pastor Shangarai’s son, enjoying mahewu – the school feeding programme. John & I visited Ardwell in hospital last week & paid for another 2 units of blood for him. One of the teachers was able to speak to his doctor there & get the true story. They have been treating the pressure sore as he has been bleeding out through that. There was no question of an op until that was sorted. They now say that his blood has been constant & they will probably go ahead with the op soon. Grace is very much better. Thank you for your prayers. The hot weather is still with us although it is humid today – perhaps some rain on the way? We are so grateful for those who faithfully support us every month. May God richly bless you. However, last month we had so much expense – vehicles, the Ranger & the Landrover & a redundancy payment. Then we were given a contribution from Foundations for Farming & a surprise gift from a friend in Formby. Over the last couple of years despite all the wonderful support, the needs here have been so pressing that we have had to dig into our reserves. This month we were told that the reserves were no more & we were cut back. We have been here before so no sweat! We got a message from someone in Birmingham who we have met once to say that her school, friends & relatives had had a collection for us & to collect it at her mother’s in Harare. We were expecting a few hundred at most. Imagine, the gift was exactly the amount of our deficit plus 50c. God is able to do more… Amen. Greetings from an extremely hot Zimbabwe. We are experiencing a heat wave at the moment. The temperatures have been in the mid 30s which is fairly normal for this time of year but this week will be in the 40s – the Zambesi valley & Kariba about 45. We have no plans to visit there. Apart from this there are extensive power cuts. Paul & Les (Harare), our Grace Bruce (Kadoma) have been having no electricity for 10-17 hours a day every day. It’s very difficult for Bruce to run the butchery, the generator to keep the cold room is expensive & frequently overheats in these temperatures. On Ameva Farm they were without electricity for more than 24 hours on Wednesday/Thursday & no water could be pumped to the schools. Our house area has not been too badly hit until the last couple of days, when it has really started to get hot. We are told the water level at Kariba pumping station is very low. Think of us here all quietly cooking! Firstly, Ardwell is still in hospital in Harare. The teachers at Ameva had a collection to buy more blood for him. He then got frightened & refused the operation. Pastor Ebenezer has asked his uncle to talk to him as we can’t have him back here in his present condition. Grace is now back home. She was diagnosed with a slipped disc (had tests & an MRI scan). She has been given a brace, exercises & some drugs. She has been told to take care & not lift or bend for 6 weeks. She can now stand up straight but is still in pain, so we hope she will follow the instructions. Been very, very hot & we had a storm with torrential rain in Chegutu yesterday. However it was very local & there was no rain on the farm nor in Kadoma where Grace is. There have been several boreholes drilled in our area, including a public pump at the shops. Our borehole is not pumping so much water now. Please pray for rain this year. El Nino is very active but it would cause suffering & loss of life if there was a drought here. We had another sad incident this week when one of the girls at the Secondary School was raped. It happened at her sister’s home where she is staying on the plots. She is a nice girl, an orphan, & has a grandmother working in Harare who pays for her. She has now moved, the perpetrator has been caught but his family were putting pressure on her to have the charges dropped. We are now waiting to see what the social welfare will suggest. One church member gave testimony last week that she had just moved from a bus stop when a robber wielding a knife stole someone’s handbag. Again she was offered a lift but felt to refuse. Later she passed the car & saw that it had crashed with loss of life. Stanley, whom some of you know, also gave testimony that he had a job driving a pick-up from Namibia for someone & was twice saved from a serious accident. We have a very practical, personal God in Zimbabwe…. Ardwell has had 4 lots of blood & they are saying he will need another 2 before he can be operated on. We hope to sort something out next week. Our daughter, Grace is suffering from chronic back ache. She is waiting for a bed in Avenues Clinic Harare to go in for investigations. We never made it to Botswana. Unfortunately the engine overheated when we were about 100 miles down the road. We were towed back & the Ranger is now with the motor mechanic. However, we were able to hide & have three days “peace & quiet”. John went down with a head cold & I cleared out some cupboards! Ardwell was treated for his pressure sore in Chegutu Hospital & has now been transferred to Harare for an operation on his broken leg. The treatment is free except for having to pay for some rather expensive blood. We contributed but have also encouraged the church & secondary School, where Ardwell works, to help. We have another hospital case this week. Ardwell broke his thigh bone. Some of you may know him – he is paraplegic, having lost the use of his legs in a tragic accident when a wall fell on him. He was getting out of bed & missed his wheelchair. He also has a very bad pressure sore which he hadn’t told anyone about. Not sure what can be done but he is at present in Chegutu Hospital. The Joromi family, who were poisoned, are all back home or been moved. The son came down from Harare & told his sisters to take their children & look after them themselves. A bit late but necessary. This son has now taken his parents to his home for a break. We have had some difficult labour problems on the farm but hopefully now resolved. However, it is very hurtful when people want to fight, so unnecessary as nobody wins. We are making a trip to Botswana tomorrow for business & shopping. It will be the first time we have been in 6 years. Grace & Daniel, our grandson, are coming with us. We had a medical emergency on the farm on Thursday. John was taking cattle food up to the farm when he was stopped on the road by the farm compound (village). A whole family had been taken ill, said to be poisoned. He had to quickly off load the food & load these two grandparents & three children on to the Ranger. The whole community was out to help organised by Lydia, Ebenezer’s wife. There is a municipal dump at the end of our road & these children had been scavenging. Apparently that morning they found some “sugar” & took it back to have on their porridge. It appears this sugar contained insecticide to kill flies. (Whether put by the Municipality or left as refuse, we don’t know) All five were in an unconscious or semi-conscious state when they arrived at Chegutu hospital. Nobody was willing to help unload them, John had to pay upfront & when they were left in the (long) queue he had to go & demand the doctors came & saw them. He was ordered out of the consulting room but he stuck his ground – it helps to come from Liverpool…..Anyway they were attended to & thanks to prayer & swift intervention were soon stabilized. They were all discharged yesterday. It’s a difficult situation. The old man used to work as a guard at the Secondary School. His daughter, who lives in Harare, left her three children with him & as far as we know does not send any support. We have allowed them free places in the school but other than that haven’t been able to help for fear of sending the wrong signal to other would-be “child dumpers”. The daughter had been called & was later at the hospital. We hope she got the message. A very busy week, the highlight of which was the party yesterday for orphans & vulnerable children on the farm. I’ve attached some photos but the programme went like this. It was a very last minute arrangement but news of a good thing spreads fast. The party was to start at 10ambut children arrived at Ameva from 7.30am. After a quiet sedated beginning – singing & individual numbers, the atmosphere heated up with the outside games. The sack race particularly caused hilarity because many contestants fell over… Beef & chicken were on the menu, a rare treat as most families are vegetarians but not by choice. Some children were with relatives as it is still holiday time but Grade 7 children were taking extra lessons at the school so they were able to join us for lunch. We fed about 130. Good-bye at 2pm – home with 2 biscuits & a sweet. A happy day! August is the month for ladies meetings here. Every church has them. Our churches met up this week end & asked me to speak this morning. We had over 50 ladies from all the churches & from a church in Harare. I never feel speaking is “my thing” & was tempted to say I would give it a miss this time. But then I realised that the girls really wanted me to come so…… My mind seemed blank but for a different reason I had been listening to some GW North tapes (yes I do still have a tape recorder) & got fired up. Amazing that these talks were made over 40 years ago & yet they are still full of truth & revelation. I spoke this morning for over an hour & there was a wonderful response. Not my doing but I was grateful that God is faithful. 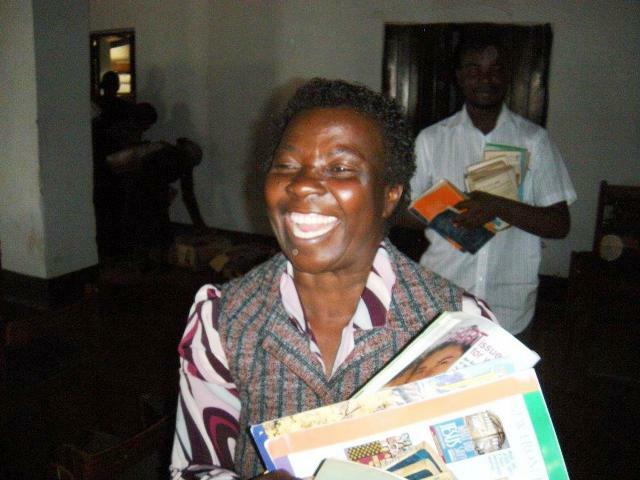 Pensions for the retired teachers have now been paid – thank you for the prayers. On the official IMF economic data for 2013 Zimbabwe has been listed as the second poorest country after DR Congo. However, in the intervening two years, the economy here has continued to decline at an alarming rate. Government policies have deterred investment. Companies are closing & people being laid off. Over 90% of the working age population are unemployed. This week in Chegutu the chicken abattoir/processor laid off 11 workers. They were given their month’s wages & told they were no longer needed – no notice. The workers included our Pastor James’ wife & one European. There were tears & despair. When you know people it brings home the reality of the situation. There is no social security in Zimbabwe & the welfare services have not be functioning for many years. Our retired headmaster has not received his monthly government pension of $80. It is 3 weeks overdue & no sign that it will be paid despite the desperation of these old people. We really fear what the future will bring here. People are beginning to get very upset. We have had a very busy 2 weeks with the Bible College & today 18 students graduated; 10 on the certificate course & 8 on the diploma course. I hope you like the picture. Some of you may be able to recognise Lydia, Tracy & Enos among the students. The certificate graduates were given a copy of Les Wheeldon's book "The Human Compass" & the diploma students were given some excellent AIDS books from Strategy for Hope. It was a great time. Sadly the Bible College cook, Patricia lost her son, Saul, unexpectedly two days before the session & we have just heard that Rev Tshuma from Christian Marching Church, who lived at Ameva for many years died on Friday. David, who tragically lost his son last month, was a diploma graduate. We will be taking Andy & Ian to the airport tomorrow & visiting the Tshuma family in Gweru on Monday. A brief message to say that the Bible College session starts on Monday & graduation for the certificate & diploma courses will be on 1st August. Andy McDade & Ian Afflick arrived today & will be with us for 2 weeks. We had a sad event in our neighbourhood. On Monday we heard that our neighbour across the road had lost his only son. David is a diploma student at Ameva Bible College & a Methodist preacher. His son (29) had been out Friday night & was attacked – for what reason we don’t know – but left near his house. He was taken to hospital & died on Sunday night. He leaves a wife & toddler. African people really make an effort when somebody dies & they stay with the family until the body is buried. The wake goes on all night & Pete, who’s bedroom was that side of our house, had singing, preaching & praying to disturb his sleep. Many cars, many people – everyone has to pay their respects. The family had to wait for a post-mortem so the body was not taken to Marehwa (other side of Harare) until Friday. People like to bury relatives in their home area. It was distressing to see the family & mourners complaining that the police did not seem to be very active. There have been several muggings in Chegutu in the last month; more than one has resulted in death or serious injury. A sign of the times & the economy. We are usually a very peaceful community. Please pray for David, his wife & three daughters. Peter Moffat from Liverpool is visiting us at the moment. He has been preaching in Mozambique with Shephan & we are grateful he managed to fit us in. Yesterday John, Peter & Grace went to Martin Tracey’s funeral. He died last week at the age of 93 – a wonderful & prayerful man. When we were planning to move to Zimbabwe in the early ‘80s a woman came up to John at a tent crusade in Manchester & said that her uncle lived there. We didn’t realise that Martin’s farm was literally “just down the road” from Ameva. Because we were ignorant townies, he generously planted our maize for the first 2 years & continued to give us seed every year after that. It is 16 years since his wife was murdered on the farm & 13 years since he was forced off but he remained a wonderful testimony, forgiving & continuing to support those he left there. I have not been able to get out much this week as my asthma has been bad. Others have complained so I guess it is something in the environment, maybe due to the late rains we had. I am feeling much better now & hopefully will be back to work next week. It feels cold here but I think our winter temperatures have been warmer than some European summer ones. A couple of weeks ago we were able to give out blankets to the 18 elderly folk on the farm thanks to a kind donation. They were very grateful. Bruce, our son-in-law had a miraculous escape. When coming back at night from the farm where his cattle graze, he ran into a huge branch, half-cut hanging over the dirt road. He had been dazzled by the lights of an oncoming car. The branch demolished the cab of his old Land cruiser but “miraculously” missed him by a hair’s breadth – in fact part of it was actually lodged behind him! He wasn’t even cut by the glass! We were amazed that he was not injured when we saw the vehicle. Below is an interesting comment on the state of our economy. Recently, the rural areas have been re-organised on traditional lines. Chief Ngezi is the main man in the region. He has a court in Chegutu every Friday. If you have visited us you may remember Joyce who used to come to our church. She is now secretary to that court. Under him comes Chief Zvimba & we had a visit from him this afternoon. John recognised him as one of our former students at the Bible College but that was many years ago. He will be setting up a court on Petra Farm up the road from Ameva. Then on the next farm to Ameva we have a sub chief. Last year the schools went to this chief’s court because some able parents had not paid school fees. The court just fined them & pocketed the money but we have been assured that Chief Zvimba’s court will operate differently! Finally on Ameva we now have a headman. He is the retired, uneducated erstwhile watchman of the secondary school. Apart from all these we also have the local Councillor who also seems to have a lot of say in things – it’s all very confusing. Last week they organised a witch-hunt in the area. Our pastors didn’t go but most of the farm went out of fear & respect for the chiefs. Several of the old ladies on Ameva were identified as witches who practiced juju. Some people reported that they had seen them in their dreams etc. Nothing bad seems to have happened to them but I suppose that they did whatever one does in this culture to stop the practice. It’s all rather depressing. Where are we going? On Wednesday I took a visitor round the schools. It was quite an eye-opener to me as I hadn’t realised how big the Secondary School had grown. There are 450 children there with two Form 1 classes of 70 each. 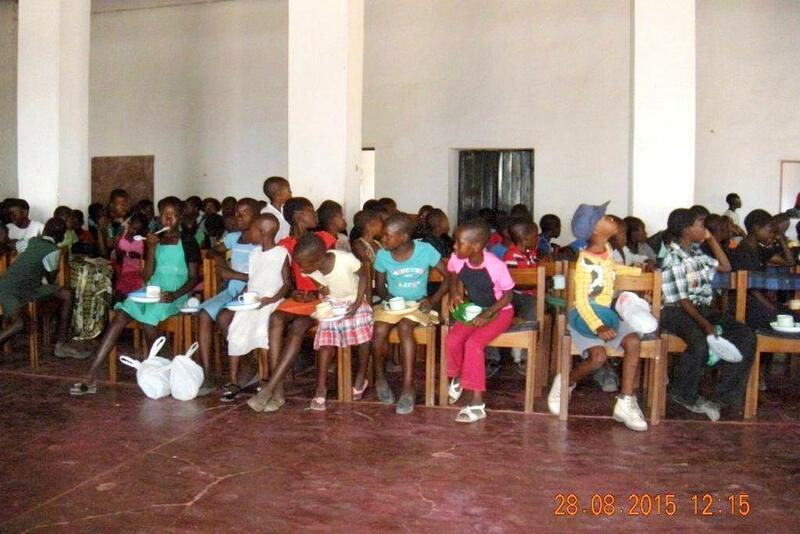 We had a big intake this year because children from Chegutu just couldn’t afford the local fees. The Government has put a freeze on all fee hikes so schools are getting round it by selling uniform. Usually parents have to fork out $200-300 before they can enrol their child. Our fees are $35 per term & the parents buy the simple uniform themselves. Unfortunately many who started well in the Secondary School drop out before they reach Form 4. We have two classes at Form 4 of 40 each most are boys only 16 are girls. This class will sit their ‘O’ levels in November. They have to pay $15 per exam but quite a few of the brighter children just can’t afford this year so will have to repeat or drop out. The teachers said they were very disappointed. I have paid for 11 orphans for 3 exams which is $45 each – a lot for people to find in this economic environment. The Primary School also has 450 children but all these children are from the surrounding farm or plots. There are 40 – 50 in a class. There are also 60 children in the preschool. Most of these children will make it to Grade 7 when they graduate to the Secondary School. Only about a third of these children will go onto Secondary School. Zimbabwe used to have the highest literacy rate in Africa so it is sad to see this deterioration. The last Minister of Education worked hard to get every child in every school text books & exercise books through UNESCO but this was some years ago now. I am always impressed with our teachers. Recently they have not had their wages paid on time but they have remained positive & dedicated. All of them are churchgoers & most have been at the school for a number of years. Please pray for them & for our children. Just spent an enjoyable few days with Lesley Evans in Harare. Her husband, Paul is in UK for a month for medical check-ups & procedure. Nice to spend time with someone – go round the shops & drink coffee! (Celia) It was scary, though, seeing the number of shops closed & sales advertised everywhere but no customers, empty malls. The economy certainly seems to be have taken a serious downturn. The Cremer family were given until today to leave their farm. This puts another 300 people out of work. We hear the new owner hope to rent out the houses but not much else. This family did so much for the community, were “pillars” of the local & national Dutch Reformed Church & keen members of the local Bible Study that John goes to. Bertie & Lena are going to South Africa & their daughter & family are emigrating to Australia. So there is another “wave” of Europeans leaving especially noticeable in a small town like Chegutu. It’s rather sad. Altogether the signs are not good but there are many praying for the country & we are trusting God will see us through. Weeks seem to go quickly. The days are bright but the weather is getting colder for us if not for you. On Thursday we visited Talent (not Ethel as I was wrongly informed) in Harare Hospital. Her leg has been amputated above the knee but she is amazingly bright. The nurses knew nothing about artificial limbs & said we would have to try other agencies. Shepherd, the headmaster of the Secondary School, is going to look into this. Talent only remembers standing with the bike by the side of the road & a car swerving. She remembers nothing else until she woke up surrounded by people. She was able to give them her mother’s phone number. At the hospital she was given 3 lots of blood which had to be paid for in advance. She will remain in hospital until the wound heals. Her school friends want to visit her & Shepherd hopes to arrange this next week. Reneki is now out of hospital. He was operated on & given a glass eye & spectacles. His parents were expected to pay $700 & the government hospital would not discharge him until they made a payment of $100. We helped them with this & hope to help them with the debt paying a little each month as Reneki will need regular check-ups. Is anybody out there complaining about their national health service? Our Niel is doing really well. Now at home & taking short walks. His breathing is better but still has difficulty sleeping. The injured children from the schools, Ethel & Reneki, remain in the hospital in Harare. We hope to make a visit next week with Shepherd Ziramba, the head of the Secondary School. After a very long op Niel is making amazing progress. He was moved down to the ward within 24 hours & may even be released on Tuesday! Janna, Niel wife, was very strong & kept us in the loop. Thank you so much for your prayers. We are all very grateful. 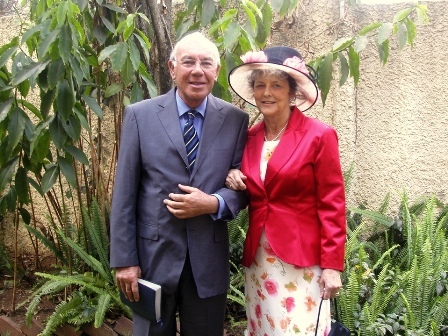 Last Sunday we said good-bye to Larry & Ruth Hill at the Mozambique border. They were visiting missionary friends at Chimoio. We had a great time with them in Vic Falls, where the river was in full flood but the mists cleared periodically so we witnessed the awesome wonder of God’s nature. Larry, Ruth & Terry (from Aus) were a great blessing to us all. A couple of sad happenings at the schools. A girl who is in the last year at secondary was injured in a hit & run accident – she was riding a bike. Sadly her leg had to be amputated. We are waiting to see if a prosthetic limb can be made & if it will cost money. Then last week-end a child in the primary school (11) was blinded in one eye by battery acid. He suffered great pain. These children really need the protection of prayer. Otherwise the schools have started well & the children are enjoying their maheu. However, with the harvest failing & El Nino promising another drought next year, things do not look good. Keep praying for us. Our son Niel in Liverpool has a heart op (valve replacement) on Thursday. We had a great week at the Pastors’ Conference. So wonderful to see familiar faces & fellowship renewed. Larry preached on Nehemiah & his message was much appreciated. We were blessed!! 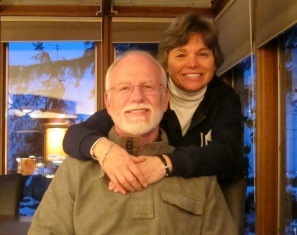 Thank you for the prayers – this week always renews our vision – this is what we are here for. On Friday Paul Evans joined us to take some sessions & sadly we said good-bye to Terry who returned to Harare with Paul to fly on to Australia on Tuesday. We are taking Larry & Ruth to Victoria Falls next week & then to Mutare from whence they will cross the border to Mozambique to visit missionaries Francis & Ursula. Bryn & Sue Vaughan (Longcroft, Wirral) who were with us in February have a made an up-to-date visual presentation of Ameva. If any church, fellowship or group are interested in seeing this, please contact Terry at the above e-mail address. Our Pastors’ Conference starts next week and today we welcomed Larry & Ruth Hill. Larry is the main speaker although we have others from Australia (Terry), England (Paul) & the West Indies as well as representatives from the national fraternity. Terry was out yesterday with pastor Solomon doing a major shop & John took 20 new mattresses up to the farm. It has stopped raining although the road is still terrible – not really a road at all. Tomorrow (Sunday) we are having a combined service at Ameva with bread, tea & maheu to follow. It should be a good time! On Monday I have invited several “murungus” (whites) for lunch time. Bertie & Lena are sadly leaving for South Africa after a heroic struggle to keep the farm which has been in the family for over 100 years; Berry is now leaving to join his wife in UK; Eric & Ros - good friends over the years, erstwhile Bracknell Fellowship, first Amevites (1980s) now teaching in Harare; Howard & Jan - heading up the local private primary school. Please pray that this week will be a real blessing to many. We feel it is such an important time & God needs to move here. Today marks the 25th anniversary of Zimbabwe Independence. When I went into town this morning it was, to all intents & purposes, business as usual. The shops were open, the market stalls were active, plenty of shoppers. Of course 20 years ago Independence Day was strictly observed & the stadiums & fields were full of people celebrating. People did not want to be seen ignoring the “victory” but they also had a good party with food & drink. Not any more….. It has rained continually through last night & today so whatever efforts had been made by local officials did not now (if ever) interest the majority in Chegutu. This rain is totally unexpected & amazing. The rainy season here finishes in March & we have never known such late rain. There is now so much grass on the farm that the cattle are grazing next to their pens. It is good to have Terry from Perth, Aus with us again & he is presently painting the old kitchen at the Bible College. John, Ebenezer & Solomon are teaching in the Bible College. It’s been quite hard for them to juggle between the certificate & the diploma course especially as Solomon was called to take a funeral. There has been no outside help this session. The borehole on the farm has packed up, our emersion heater has blown up, the road to Ameva is being washed away but ,hey, we have the pastors’ Conference in one week’s time & this is Africa. What a wonderful Easter Conference we had! Everyone seemed to have a good time despite sleeping on the concrete floors. John spoke on Friday night & Sunday morning & I ,Celia, spoke to the ladies on Saturday afternoon. Having been to a few of these meetings, I know that by that time a lot will be ready to snooze so I ditched the idea of talking & decided on a fun time. We had a quiz on “Women in the Bible”, cheating was allowed & everyone got sweets so it went down well. Sunday morning we were at the dam for baptisms; 35 in all. Some rededicated their lives to the Lord as they had come back to the church. Looking over the dam it was so calm & peaceful, so beautiful that John & I both felt that we missed living on Ameva. It is not possible at the moment that we could return & it may never be possible. Easter Monday we had our lamb roast & invited a few people who were alone. Monday night it rained & I mean rain! We had over 100ml (5”) in a few hours. The rain gauge overflowed so we don’t really know how much. On the farm the top dam filled & the bottom dam half filled. A shower or two the next day but nothing since. It is getting hot again so we may get more next week. It is unheard of to get rain like this so late in the season. Everyone is thanking God for the miracle. Thanks for your prayers, we had a shower last Sunday but it rained heavily all night on Tuesday. The farm had nearly 5 inches – enough to refresh the grass for the next few weeks. It has been humid again & looks like it could rain again in the next couple of days. Very late in the season but very welcome. The Easter conference is well underway at the Bible College. John preached last night & I did a quiz with the ladies this afternoon on women in the Bible. I think they enjoyed it . Cheating was allowed so everyone got their allocation of sweets although with nearly 50 there I didn’t have enough questions for the back row. Tomorrow we have to be up early with baptisms at 8am followed by communion & ordination of deacons; then lunch. We should be through by 4pm. On Monday we will cook the leg of lamb & have a few people round who are without relatives here. The hot weather has continued this week. The rain stopped at the end of January with a few showers at the beginning of March. Today, however, has looked more hopeful with just enough rain to wet the ground & give that nice fresh scent. It is too late to save the crops but with high temperatures it will help the grazing if the rain continues. Sometimes it is difficult to know if one is doing the right thing. I managed to get some funding for one lady on the farm compound who had major dental problems. After one visit to the dentist at the hospital & two extractions, I have had difficulty getting her to go again !!!!!!! I make appointments, go to the hospital but she doesn’t show up. Having myself recently suffered from tooth ache, I can appreciate the problems but this is affecting her general health. What to do? I have been trying to cut down on all the requests to pass on money to individuals. It is just these little jobs, errands that seem to take up the time & with the internet & mobile phones people abroad can now send money themselves. We are looking forward to the Easter Conferences on the farm. Our church Chegutu Christian Fellowship is meeting at the Bible College & the Midland circuit of the Christian Marching Church is meeting at the Secondary School. We have these conferences Christmas & Easter & in August the Women & Men have their own separate get-togethers. This, apart from occasionally visiting relatives, is the only holiday most get. The singing, the dancing, the worship, the sermons, the l-o-n-g meetings. They love it! Folk who have recently visited us will know Berry, who runs the local garage repair shop. His wife is a British national & had been working on & off in UK to supplement their income & provide a pension. Unfortunately she was taken very ill & had to have major surgery. Because of her medical problems, she is no longer able to live in Africa. Berry had a Zimbabwe passport so was not able to get a visa. After a long struggle he was allowed a holiday visa & did see his wife in UK for a few weeks. He has struggled for over two years to get permission to live & work in UK. His son & daughter are also in UK & his son was able to give him a job. However, because he had always been honest he was refused many times. Berry had always assumed that his family had lived for generations in South Africa. Amazingly a search last month showed that one of his grandmothers had come from a poor district in Liverpool, near Toxteth Park Cemetery & that he therefore qualified for an ancestral visa. He applied again but frustratingly his appointment was delayed. When he did finally go for the interview, the exact person who would be dealing with his papers in SA just “happened” to be at the Zimbabwe office. She agreed to look into his case with the result that he is now in possession of an ancestral visa enabling him to reside & work in UK. A “ trial of faith” but with a happy ending. It is quiet here now all our visitors have gone. We do enjoy company as it can get lonely here. The Chegutu Christian Fellowship is organising its Easter Conference at Ameva Bible College. The Christian Marching Church is having their district conference in the Ameva Secondary School – there should be over three hundred people. This week we also had a planning meeting for the Pastors’ Conference in April when Larry Hill will be preaching. We are planning to formally open the revamped Bible College library at that time. It is a brilliant resource & we plan to make it available to all those involved in Christian work. It’s very exciting. We would like to thank all those who sent laptop computers – it has really made a difference to the morale of the schools. The Secondary school still needs two or three more so that all the department will have access to one. We also need some educational games especially for the primary school. If anyone can help please contact Terry at the above address. It has continued to be very hot with no rain. Most of the crops are now past saving & it will be a hard year for most people. 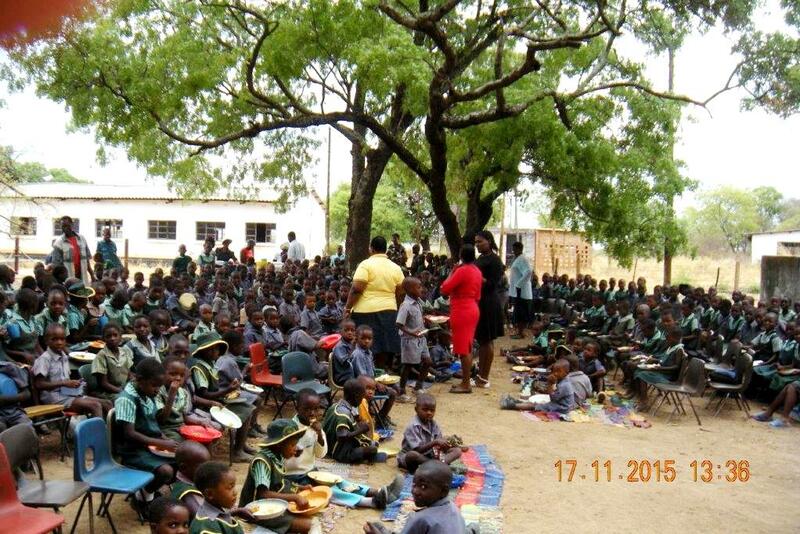 We continue with the feeding programme in the schools & it looks like this will be a life saver. This year the government have not yet renewed their help with school fees for disadvantaged children. This will leave a big gap for us. In the Primary School 31 children were receiving help from the government as well as the 50 children that Ameva was helping. If you would like to support a child, please contact Esther fmnavail@aol.com at Forget-me-not, Avail. Another Bible College Session is over. John was out at 6am this morning to taxi the remaining people from the farm to Chegutu for the early bus to Bulawayo. During the first week Bryn was teaching on “Missions, Discipleship & Evangelism”, mainly focusing on the local church. This week we have had a Kairos team (World Outreach) giving presentations on mission & evangelism from a world prospective. It certainly widens the students’ horizons. Congratulations are in order to both the Ameva Primary & Ameva Secondary Schools for being top district schools at their respective athletic competitions. Mr Ziramba, the secondary school head, puts it down to the fact that our children have to walk so far to school & that we have a feeding programme. No rain again this week although we hear that farms further up the road from Ameva have had some. Overall it is very patchy with no good rain now since December. We arrived back from Thailand last week. It was a very worthwhile time with the family & lovely to see our friends Sonam & Barbara, Sue, Marg & Paul. Bryn & Sue from the Longcroft were on the same plane as us & the Bible College session started Monday. John was ill with tonsillitis & couldn’t teach. I have now caught the bug. Clare & Peter from Epsom arrived on Thursday – Clare was teaching here for 10 years but it is a first visit for Peter. Pastor Jonathan’s son was in hospital with a bad umbilical hernia several weeks ago. The doctors’ were on go slow so he was discharged & told to come back last week. They were definitely expecting him to have an operation but found that the hernia was closing by itself. Even the doctor was surprised! John had a nasty grilling by Chegutu Police Intelligence Officer on Tuesday. Apparently some Canadian diplomats & others had been visiting the Foundations for Farming plot on Ameva without our knowledge. We were told that it has since been sorted out by FfF so hopefully that is the end of it. However, it just goes to prove that the farms are still a no-go area. It is many years since we were able to have any teams from overseas to help on the farm & it seems that it will be a good while yet before we can do so. Any white face causes suspicion & there are many informers! No rain for 2 weeks & we desperately need some more. Martin & Marian Williams passed through this week on their way home to Malawi – they have some big decisions to make so please pray for them. On Friday we are off to Thailand to see old friends, Sonam & Barbara Llendup from Bhutan, some other old friends & member of our family who decided to tag along when they heard we were going to the sea-side. Thus we will be out of communication for 3 weeks. So sorry to hear about the bad weather in UK! Another quiet week but schools open next Tuesday after the long holiday. The rain has stopped which is a good thing as there was flooding in some places & my asthma was bad. However, it is getting warmer so I think it will rain again later next week – just right for the crops. The maize grown on Ameva as the demonstration crop by Foundations for Farming looks really impressive. It is just by the road so we hope the locals will be encouraged to use this method. Some of you know our Pastor Solomon has a congenital disease which has resulted in blindness – 3 of his brothers are also afflicted. On Monday he starts a course at the Blind School. It is a great opportunity. They are going to load a programme on his computer which with, lessons, will enable him to fully use it. We will be taking him to Harare tomorrow as we are going to celebrate an important birthday for our friend, Paul Evans. Sorry about the winds in UK & the cold snap in US we are hearing about on the news; the terrible shootings in France. Maybe Zimbabwe isn’t so bad after all. Well, we like it here. Thanks for all the news & updates from around the world. It is so nice to catch up with everyone & to know that we are one big family – the Church. One of the blessings of living in a third world country is that the emphasis on Christmas is where it should be or rather on Whom it should be. We gave the workers at the farm a small bonus for extra groceries for the season, a Christmas card & 2 bottles of fizzy drinks each. They were very pleased & I think that will be the only presents those families get. Most families won’t get that this year but even so I think most will go to church to remember the birth of Christ. When I buy any new article of clothes I have a policy of throwing something out. As we have been in UK this year & people & visitors have been very kind, on Wednesday we were amazingly able to give an outfit to all our old people (17 – 13 ladies & 4 men) on the farm. I had also managed to nag John into parting with some trousers & raided his sock draw but he does know about that……I must admit I do like giving things, it gives you a warm feeling but I have been challenged lately that I don’t give thanks to God for all we have. Most of all we thank God for giving His Son to die for us. May you have a great Christmas in this knowledge. Our Church Party last week was a very wonderful time. The service started at 10.30 & we got home about 4! After Holy Communion, Bernard was inducted as pastor in Kadoma & he & his wife were prayed for. We then had a choir competition – Petra Farm won the Senior & Junior prizes. Then all the pastors including ourselves were given gifts – a large box of groceries (all pastors got this including us) & a spice rack (for the Valentines; I think others got crockery) The Church people are so kind & giving despite their problems & we have never hugged & been hugged so much. Chicken, beef, rice, coleslaw, relish, cake. We came home exhausted! It has been continued a busy week with various Christmas activities & a memorial service & apart from a few cards we have yet to put up any Christmas decorations in the house – maybe on Monday I shall ask Eunice, our worker’s daughter & her friend to help me. Thank you for your prayers. We had a good downpour of rain on the farm & the grass has started to grow. Nothing much here in town or in Harare - all together very patchy. The heat has returned but the forecast says more rain of celebration in this country, commercially the season is low key. This year there is not the money around. People traditionally go to their rural areas & the children are sent to grandparents in these holidays. So we are having our church Christmas party early - tomorrow! It's an eagerly anticipated event with the members of Chegutu, Petra, Ameva & Kadoma churches getting together at Petra farm. Wish you were here! We've been taking photos on the farm & this one is of our main pastor, Ebenezer, in the farm office. He has been a key member of the teas suffered persecution but has faithfully stayed at his post. I have been trying to send these weeklies on a Friday night but for the last 5 months the wifi has been cut off each month for non-payment despite us being able to produce a receipt. We have yet again managed to get them to switch us on again after 36 hours. The electricity has been on & off for over a week & was, of course, off most nights. Then my computer keeps freezing & this is the second time I have had to type this. The heat is too much & these irritations we could do without. No rain yet – it’s really late. We had a great testimony in church on Sunday. Elson told us his son had been seriously ill. He was given tablets at the government hospital but returned because the child did not improve. However, he was told the tablets his child had been given were sufficient. He took his son to a private clinic but after 4 days they said the child’s condition was serious & he must take him back to the government hospital. That hospital again didn’t want to admit him but, after much persuasion & prayer, did so. All this time Elson & his wife were being told by “friends” & family that his son had been cursed & there was a very good witch doctor with a known track record who could help. Elson’s own mother wanted him to take his son to a “prophet” & his refusal caused a family rift. Cultural superstition & fear play a big part in the community & it is wonderful that Elson & his wife stood firm & insisted that to do other than seek medical help would destroy their faith. After several days of tests during which the child got steadily worse, he was diagnosed with typhoid. He was so weak by this time that the doctor said he needed a blood transfusion which would cost US$114. Elson tried to negotiate but the government hospital wanted the money. In despair, he & his wife prayed in the hospital car-park. He then went to the market stall he owned & found cash from sales of US$80. Just then his uncle walked by & hearing his story gave him US$50. The child has now received treatment & is recovering. 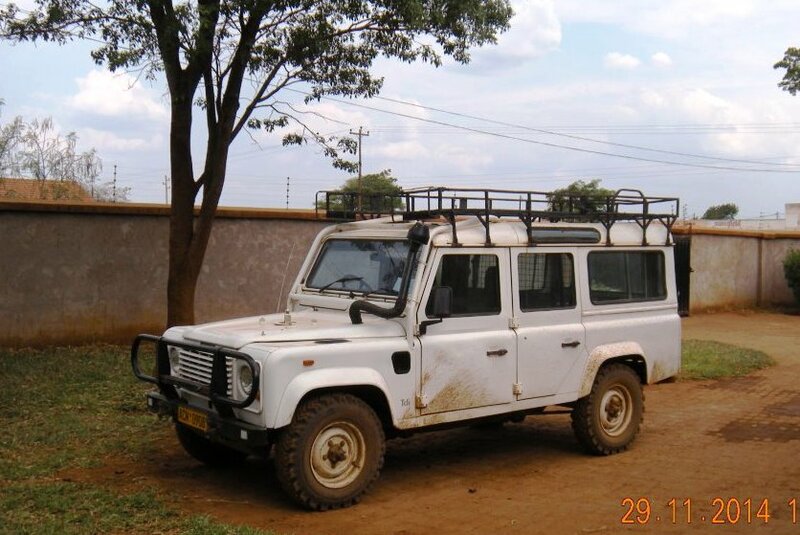 We thought you would like to see a picture of the Landrover – some of you may remember it. In the early 1990s a group of young people drove it here from UK. It is now well over 20 years old & still going. John drives it up to the farm & the engine is good. There are some other problems & we are attempting to restore it to its former glory (well, not quite) as funds become available. Today’s Zimbabwe news is world news with eleven people killed & many more injured at a prayer night in Kwekwe organised by a very popular healer/miracle worker, Walter Magaya. He draws huge crowds – many of them desperate people. Apparently 30,000 were at this meeting with only one exit gate & there was a stampede. Reports vary as to what happened. These Nigerian style miracle workers have become very popular here especially as people see it as a way out of their economic problems. Member of the Zimbabwe opposition party MDC are known to visit & consult T. B. Joshua in Nigeria. We heard that one just returned in a body bag – having been one of the many killed when the guest house there collapsed. It’s all very sad. The Bible College is in session & we have Grahame Davies from Epsom with us. We are grateful for the privilege to set these pastors & church leaders on the right path. We returned from UK over two weeks ago. It was great to see so many friends & of course our family – notably our new granddaughter. We arrived back at Harare airport to find that we must be tested for Ebola – questioned where we had been, our passports checked & our temperature taken by laser. It’s amazing how much ignorance there is about this disease. The serious Ebola outbreak is found in two West African countries of Liberia & Sierra Leone. We have never met anyone from these countries in Zimbabwe & yet because Zimbabwe is in Africa (a very big continent!) people are cancelling their holidays here. Isn’t more likely that people from these countries will go to Europe or USA? It is extremely hot at the moment as we are waiting for the rains to come. Please pray as the cattle are beginning to suffer. Thankfully our passports were at the Consulate – thanks for all the prayers. They told us that they only inform & issue passports twice a week but as we suspect (& according to the UK Passport Office) they had been there quite a long time, we wondered if it was actually twice a month. We then went to Zimbabwe immigration & were in & out in 20 minutes – no contest! We are now set to go in one week & will be visiting our friend Christina in Cyprus on the way to UK. Back here mid-October. Please note we will not be answering e-mails for the next six weeks. Another encouraging service this morning up at the farm. The churches combined & afterwards shared a meal. The singing, as always was amazing & the dancing only marginally second. One feels privileged to have such fellowship. Time is going so quickly & it is just under two week we fly to Cyprus & then to UK. I did manage to get through to the UK Passport Office. They said that our passports had been issued, printed & sent middle of last month & we should have had them in 10 days latest. No one could tell us whether they had been sent to the Consulate or to our address but the advice was that we should enquire for them ourselves. I have been to the local PO & tomorrow we are going to Harare to the Consulate & DHL. We need to get Zim residency stamps put in our passports before we leave. I do feel that all will turn out well but it is a cliff hanger. What mess the world is in. At the moment I wonder if it is safer to be in Zimbabwe than Europe. Safest still to be in the will of God, though! We had a wonderful celebration of the ordinations on Saturday. There were over 1000 people present & though the service went on for 5 hours, it went quickly. John preached & he had to cut it short but was commended by all. It was great to see so many old friends. The church wore their uniforms, the praise & worship team dressed in first purple & then yellow. They looked gorgeous. Great to see these young people giving their all to the glory of God. The rest of us were wearing our “glad rags” – men in suits, women high fashion. Since the shops are full of colourful clothes from China standard of dress has risen sharply. Africans love clothes. About two years ago John & I attended a large convention in Harare. As I looked round at the suits, the silks & the satins, I suddenly saw myself as a “poor white”. It was a defining moment & I have endeavoured to make more effort since. Tip – if you are a visitor & want to be taken seriously by the African church, bring something smart. Still no news of our passports & we have less than three weeks before we travel. We work with a church called the Christian Marching Church. The founder members split with the Salvation Army in the 1950s over doctrinal issues. Next Saturday we will be going to Harare for the investiture of several new bishops in the church. This will mean more autonomy for the different districts & give a better structure to the growing church. Bishop Katsande, chairman of the Trust which owns Ameva Farm, has now been made archbishop. This was a bit of a surprise to us but we understand that he has had problems in the church & needs to keep a firm hand on overall issues. In Africa the church likes to observe formalities & titles. People like to have a chief & since this church encompasses the full spectrum of the population, it is good to have a wise man like him at the helm. He & his wife are good people & have united the church & always set a godly example. We are so thankful that we are working with them. Please pray for the service on Saturday – John will be preaching. 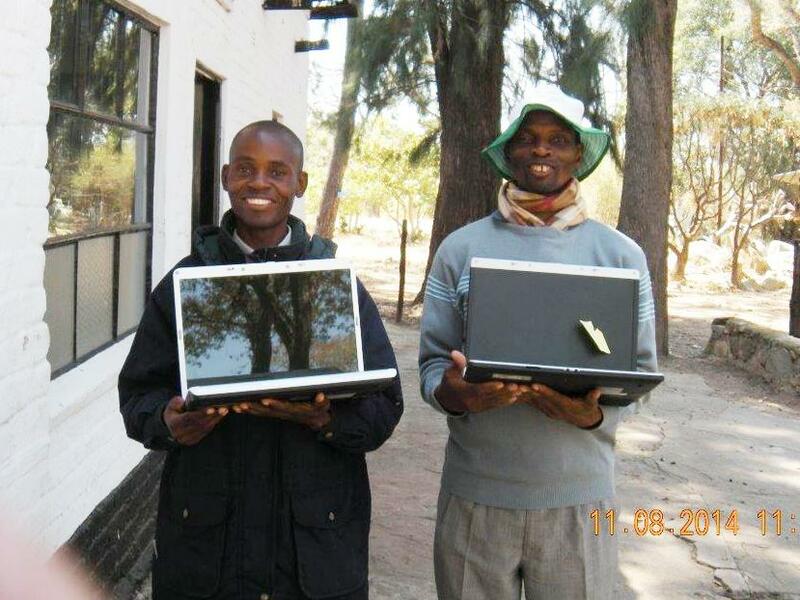 We are sending you a picture of our two main pastors who teach in the Bible College - Ebenezer & Solomon with their 'new' computers. As you can see they are both thrilled. We have also been able to pass on another computer which came from Warrington to the Primary School & there is yet another one waiting to come out from UK. The schools (primary & secondary) have got a deal to hire ten computers a term for $600 per school which will be serviced & replaced every 3 years, (also insured which is important). This will be the first time that the primary school has had computers. However, we feel it is important for teachers to have a computer themselves (at $250 per month they just can't afford) so our appeal is still open. Please get in touch with Terry or Jim at the above address if you can help. All computers are checked by a charity & refurbished (eg new battery) if need be before leaving UK. At the moment it seems like Chegutu is under blockade - an island cut off from the outside world. On Wednesday I went to Kadoma -30km/20miles away. It took me 1 ½ hours to get there. On Friday John & I went to Harare – 100 km/60miles. It took us 2 ½ hours to get there. The problem is road works on the main Harare-Bulawayo Road. Long stretches of road are being reduced to single lane/one way resulting in long waits as vehicles from the other direction come through. A lot of the detours are on rough dirt & we & everyone else journey as little as possible. John had a hard drive to & from Bulawayo last week. He is taking a lecture in Harare next Saturday morning & will have to stay overnight to be on time. Well. It will be nice when it’s finished! Our trip to Harare involved sending info for renewal of our British passports. They wanted more documents to prove that we actually live here (despite having permanent residence & a valid year’s resident re-entry visa in our old passports). It has already cost us $90 to send all the info. DHL & we are charged an extra £20 by the British Government to send the new passports back . The old system of renewing the country of residence was much better. No wonder there is such a backlog of passport applications in UK. It has already been nearly 2 months; please pray our passports will be processed so we can travel & see our new granddaughter in September. On the farm – the ladies are a wonderful church conference – they were texting to say blessing abounds…. In church this morning Pastor Jonathan introduced 2 young men that he had brought along. One had manned a small kiosk just along the road from where he lived. He noticed that the youth had dreadlocks & was a smoker & a drinker. It touched his heart that such a young man was on a downward path so he started praying. For many weeks he had no liberty to talk to him but he kept praying. Then he saw an answer to prayer – the dreadlocks had gone! He prayed on & early one morning felt the leading to go & speak to him. One result was this young man & his friend were in church today; another - they committed their lives to Christ. I feel privileged to have a pastor like Jonathan & humbled by his example. A little boy walking down the road in Chegutu was bitten by a dog in May & last week died of rabies. The owner of the dog had produced a certificate to show the father that the dog had been vaccinated. It was quite likely a forgery as there is no record of rabies vaccines failing. Maybe the owner didn’t want to pay for course of expensive injections for the bitten child – we don’t know. But now the whole of the town is in panic mode & this month will see visits by the government vets to strategic sites in the town to vaccinate the dogs. Any dog found without a vaccination certificate will be destroyed, as will any dog found roaming the streets. Cholera, typhoid, rabies, - there has been serious outbreaks in Chegutu in the last few years of all these diseases. It is an indication that the public health system has broken down and as most of the population do not have running water that is hardly surprising. We said good-bye to Ray last week – his guitar was a great hit with the Bible college students. John, Ebenezer & Solomon will be away at for three days this week as they are attending a teachers course in Bulawayo for the Bible college syllabus . The journey is likely to take 6 hours each way as there are extensive road works. The economy of the country has taken a dramatic down turn with over 750 firm closing since last year’s elections. At present there are 10 firms closing every month – now about 10 000 redundancies & 80% unemployment. Government policies have hindered any investment in the country & so far have not been able to offer any solutions. Their response has been to double national insurance contributions & road tolls. Public/civil servants including teachers have had their paydays moved several times. Some of the army are working two weeks on & two weeks off. Only those police collecting fines from hapless motorists seem to be doing well. There is now talk of returning to the Zim dollar – it’s a bit of a time bomb! With all this going on there is sadly a “get rich quick” trend in the churches with many advocating a “prosperity gospel”. There are about 3 big names in Harare who major on this theme. They are very popular with huge churches. Our Pastor James travelled to Harare last week & overheard an argument between a woman & the taxi driver. The taxi driver said he went to M’s church to get rich quick. The woman said hadn’t you better think about what is going to happen when you die but the driver said he was only interested in getting a “good life” now. James didn’t say anything as he was a passenger & needed to get to Harare but it is very sad. One can appreciate the attraction of such a gospel & as we are considered very rich, it is difficult to judge but please pray for the church here. I don’t think anyone would associate Africa with a blazing log fire but this evening I am sitting in front of this lovely fire in our lounge. The full moon is always connected to weather patterns. In the rainy season you can guarantee rain at this time & now with the moon shining very brightly (no street lights here) we are having a cold snap. We haven’t seen frost yet but it got pretty cold last night. On Monday we start another fortnightly session of the Bible College. Ray Wright from Warrington is here to teach & keep us entertained with his stories of working for Tearfund – he has some amazing testimonies. John will also be starting the diploma course teaching One Baptism & Romans. It should be a good time if we can all keep warm. Today was “Big Sunday” on Petra Farm. The Christian Fellowship churches from Petra, Ameva, Chegutu & Kadoma. These brothers & sisters love getting together. We started in the small building, (used to be the guest cottage on the farm) but once the Kadoma people arrived we had to move outside. It was a wonderful time as we worshipped God under the trees. But this is Africa & our 3 tonner got 2 punctures on the way back & poor John is out at the moment dealing with this. We suspect it was overloaded – too many people trying to get home. Sadly, a member of our alumni, Steven Mahachi, died unexpectedly this week after a couple of days in hospital. He leaves a wife & three children. Pastor Eb represented us at the funeral at Masvingo. When I was in UK last I treated myself to a large print, leather bound NKJV Bible. When I was in a Christian Bookshop in Harare some months ago I saw & bought another NKJV Bible which I thought was a good buy & I might give to someone. For several years I have been trying to get John into the 21st century & leave the ‘thees’ & ‘thous’ behind. Well, during his visit here John Shaw did what I could not do & convinced John that he should move forward. Now guess who has the large print, leather bound NKJV Bible & guess who has the cheaper paper print! Such is married life! Just to let you know that Artwell is still in hospital. I called to see him on Thursday & found that the doctor had ordered new drugs as there was an infection in the sores. Drugs are no longer available at the hospital & it is up to friends & relatives to buy the prescriptions from outside sources, so it was a very good thing that I went to see him on that day. He is now receiving injections twice a day & his sores are drying up. We hope he will be able to come home on Tuesday/Wednesday. I haven’t managed to see Mrs. Dunmiso yet as I am waiting to see her husband as well – he is working away. Week before last I had reason to phone Pastor Conrad one of our graduates from several years ago. He started to cry as he said his son 9 months had died that morning. It was one of those situations that one doesn’t know what to say or what one says seems totally inadequate. He had taken the child to the clinic the day before with diarrhea & had been given medicine but the boy had died in the morning. I read later that 46 people had died in Zimbabwe that week of diarrhea, 27 of them children under 5. Spoke to Conrad today & he said that they were accepting it as God’s will & trying to move on. What CAN one say? Yesterday, Paul & Lesley Evans, Pastors Solomon & Tracy Shangarai officially started the first session of the Ameva Bible College in Harare. 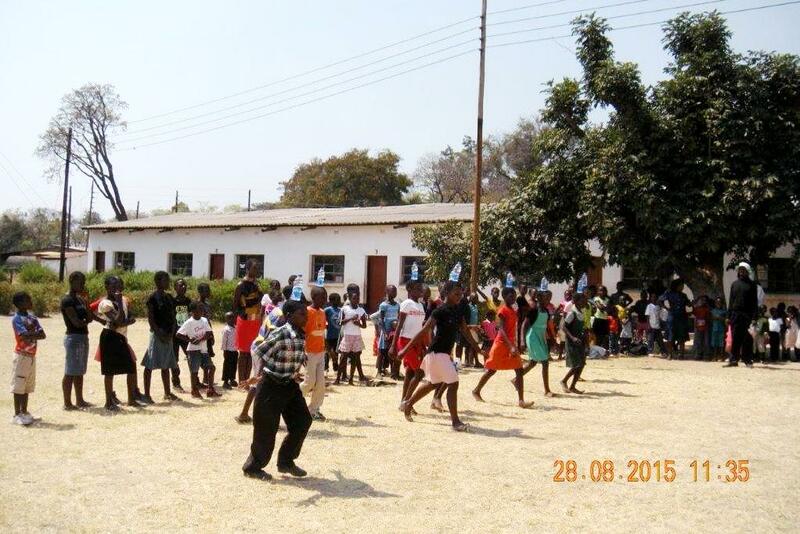 This extension follows the syllabus of the Chegutu school & will take place every Saturday. It caters for those in work round Harare. 20 students enrolled on the first day with a few more expected next week. Archbishop Katsande – of the African church we work with – wants every person in leadership in his church to have Bible training, so it is a great opportunity. Meanwhile yesterday John was down on the farm. We have 5 new dairy calves & the vet says there are 50 beef cows in calf. Please pray that we will find feed to take the herd through these arid winter months. Artwell is in hospital! This man was left paralysed about 15 years ago when a wall fell on him, killing his friend. The farmer who told them to “hurry up & take out the bottom bricks of the wall” gapped it to UK. Since then Artwell, through the kindness of some friends, went to firstly to rehab & then has been working in Ameva Secondary School office. He is wheel chair bound & over the years various younger relatives have been his carers. Last week one of them heated water for him to wash in but failed to tell him that it needed cold added. He put his feet in & was severely scalded. Pray also for Mrs Dumiso. For three years she has had various abdominal problems & depression but although (again) friends have made it possible for her to have the necessary tests, nothing appears to be wrong. The family have been going to the Apostolic sect & we feel she may have been affected by this. Mrs. D. has had a hard life. Her husband is a builder but not in fulltime work & they have 8 children. Their school fees have been paid for by Ameva donations – for which they are very grateful. I am hoping to have a constructive talk with her this week. Thanks. Good news – our granddaughter Mia Jane was born 21st May. Niel & Janna are proud parents & John & Celia are proud grandparents. We finally held the Ameva Orphans’ Party yesterday. No party at Christmas because I was away & delayed another week as we could not inform everyone. Did everyone enjoy themselves? I think so – they asked if we could have another one next week! We shouted a large thank you to the sponsors – I hope they heard us in England. We have been particularly concerned about one little girl, Nyarai. She lost her mother a few years ago, her father last year & the aunt who was looking after her died two months ago. When I saw her last term she was a pathetic little child in a dirty dress. Her father’s second wife was looking after her – a young woman with children of her own. Despite repeated attempts, I didn’t get to see this carer but was hoping to do a follow up this month. Imagine my surprise when Nyarai came to the party with her new “parents”. 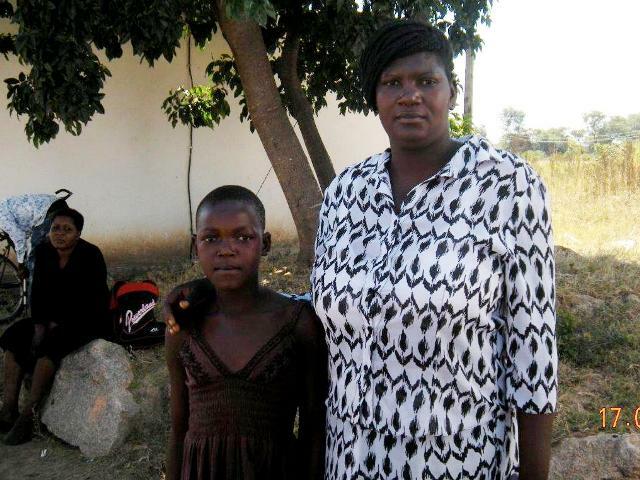 The father’s brother from Chegutu had decided to adopt her – in Shona culture as a close relative he automatically becomes her father when he takes responsibility. I could hardly recognise this smiling, happy well–dressed child! More surprises – the family were closely related to one of our church members & this morning her cousin brought her to church……Suffer the little children, our God is faithful! Here is a photo of Nyarai & her new mother. This week, after saying good-bye to our visitors, I have been confined to barracks with a head cold. After the initial two days of coughing & spluttering, nose like a tap, it has been nice to do nothing much. We went to see the gravel pits on the farm last week. Two huge earth-diggers on site & three massive trucks carting away Ameva land. Two of the trucks had “Municipality of Chegutu” on the side & I followed one to the shops opposite our house where the gravel was used to fill in potholes – rather ironical. Anyway, on Friday John & the Bishop went to see a solicitor. She will look into the law regarding gravel pits & see if we are eligible for compensation. Thanks for your prayers. This week - the Pastors' Conference, the Graduation, a Big Sunday (3 churches join together) & a Wedding. I calculated we have driven up to the farm & back 14 times this week. Several familiar faces were missing from the conference, probably due to the economic situation, but nevertheless the hall was full in the evenings & people were blessed. Our visitors did a great job & have been "well used". They leave this week. We were able to give out books from the library to the Pastors. Many books had become dog-eared & coverless or were biographies dated/not relevant but they were joyfully received. We also had hundreds of chorus books from the eighties which I thought we would end up burning but they all disappeared! The library is now beginning to look like a library! I attach a picture of the book queue. This has been a very busy month! The Bible College session closed on Friday & we start the Pastors’ Conference on Monday, graduation of Bible College students next Saturday (3 May) & ‘big Sunday’ ie joint service of four churches on Ameva next Sunday. 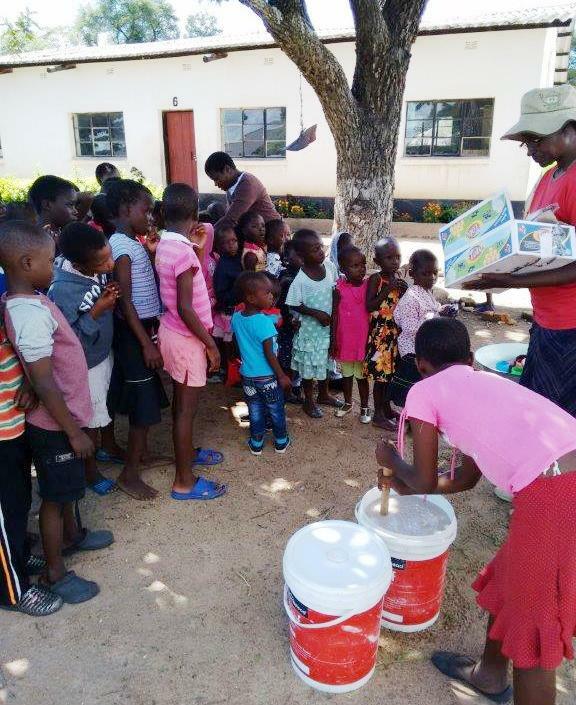 John has now organised painting the outside of the Scout Hall where we meet in Chegutu on Sunday. It all looks so much better. We have also taken down various dead & dangerous trees (not personally!) Yes, there has been a lot going on…. Please pray for the coming week. The children in our schools at Ameva are lagging behind in computer skills as we have limited resources. There is no customs on computers but transporting desktops is a problem. So we are asking if anyone in UK has an old laptop which they would like donate to our schools, please contact Jim & Margaret Bailey amevajim@aol.com or telephone 02036598799. Thanks. Easter is a time of great rejoicing in the churches here. It is a time of camp meetings, of gathering together, of fellowship. And a busy time for the guys here! Terry, Brian & John Shaw were all involved in preaching, Frances & Martha took ladies’ meetings on the farms. 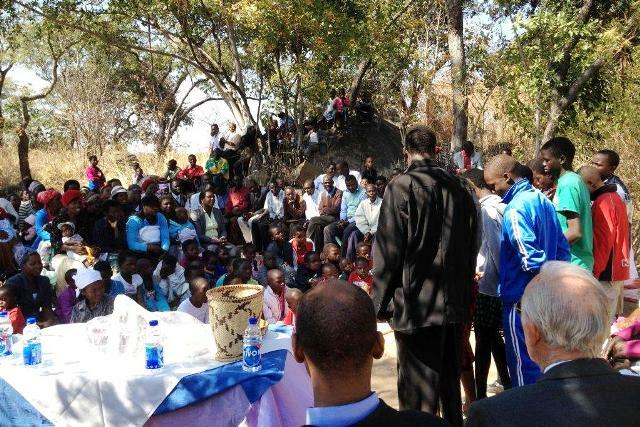 JV was preaching at the Kadoma Baptist camp. It’s been a precious time – 36 baptised at Ameva, a family of five at Kadoma. Today there were eleven of us for Easter lunch – great to have such friends. John & Martha, Terry & Frances arrived yesterday & the new session of the Bible College starts next week. John is trying to get payment for tons of gravel which has been taken off the farm by a South African firm repairing the road to Kadoma. Bishop Katsande is coming down on Tuesday to see the parties involved. Not all doom & gloom. People are still dancing here. Check out ‘Happy Harare’ video on YouTube. (Please excuse the frivolity). Sorting the Bible College Library has been a long job but the end is in sight. I have gone through all the books & turfed out those too old, too many, too much. I am so grateful for the help of Brian & Tegwen who came down for the weekend & did a second sweep so that we now hopefully have a small library of good sound reference & devotional books. 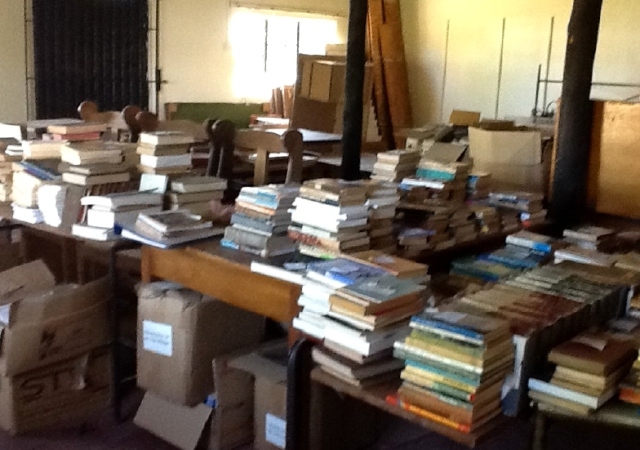 What remains now is to put the books on the computer & sort out the shelving. We do have money from the Dave Wetherley memorial Fund which we will use to refurbish the room. The rejects will be dispersed at the Pastors’ Conference or may be burnt. How quickly the weeks seem to go. Already nearly Easter, a new Bible College block followed by the Pastors’ Conference. We have a new intake of students on 14th April – please pray the right people will come. We now have a second stockman join us & have decided to keep the two on – moral support against the problem workers we have not managed to pray out yet. The country is in rather an economic mess again – what’s new…. It picked up quite a bit when we had the joint government but since the old party has come to power things have got considerably worse. After the election two & a half billion US was moved out of the country amid fears that the country was returning to the Zim dollar & with legislation in place for all companies to be 51% owned by the indigenous population over 1000 companies have closed down (& still 5 a week in Harare), & definitely no investment. By mid-month shops are empty & roads deserted – no money to buy, no money to travel. Corruption is reported in the press every day, a worldwide problem but it is in the open here & we all experience it. Well people reap what they sow & we shall see what will happen…..
We continue to have good rains & everywhere is very green. The rain was so heavy on Friday that it flattened some of the crops round here – 40 ml fell in 90 mins. There has been serious flooding in the south of the country. There hasn’t been a lot of information & there are mixed reports about the numbers of people involved. This part of the country has gone from years of drought to widespread flooding. Sorry I have been so long in replying to e-mails. I know that I have not replied to e-mails from last year. I hope in the next couple of weeks I can catch up. Sorry…. The Bible College finished on Friday. Bryn had been teaching “Missions” & last week we had a team from World Outreach teaching the “Kairos” Course, which everyone enjoyed & gained much insight into the worldwide Church. This group of students have now finished the course & will graduate in May. Bryn & Sue leaved on Tuesday – Sue has been doing some first aid in the schools. We have also had Christina Kyriakou from Cyprus who has been staying with Elsie Gibson. She leaves next Sunday. We are at present arranging teaching sessions in the Bible College for the next two years. Anyone who feels able to help in this way & has the support of their church should contact Terry Watson at the above address. We have trained several ladies who are now pastoring churches in the rural & urban situations but as yet we have had no ladies offering to come & teach. What’s wrong? This week I thought you might like to see a picture of the children at Ameva Primary School enjoying their drink of maheu. The feeding programme encompasses all the children at Ameva – 800 in all. 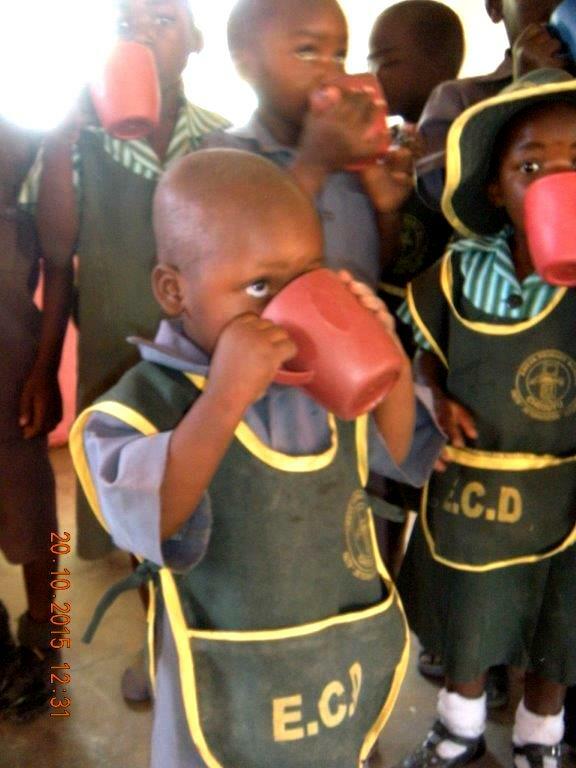 These children rarely eat meat & this drink contains soya, thus providing much needed protein. No wonder our children came top in the sports competitions with the surrounding rural schools! We are grateful for those who have given specifically to help the children in this way. 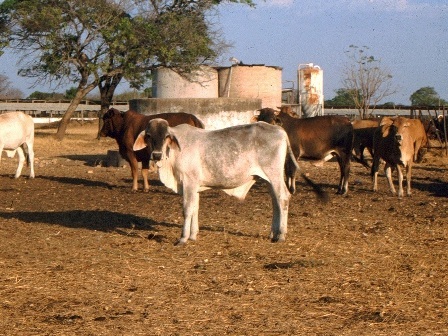 The feeding programme costs about US$100 per week. Another week seems to have gone very quickly. We had Sunday morning meeting in our newly painted hall – still things to do there but Terry has done a great job. Bible College starts this week & Bryn will be teaching Missions. The rain has stopped for a few days & it is good for the crops to get some sun, good to for the state of the roads! We had an encouraging meeting at our house on Friday when 15 pastors came to discuss the Ameva Pastors Conference & the Bible College. The new intake for the College is in April – we are hoping for some good students. Full house again with Terry from Australia, & Bryn & Sue from Merseyside. It’s nice to have folks with us. Terry will be painting the Scout Hall where we have our Church meetings & Bryn will be teaching in the Bible College; Sue is helping me get up-to-date info on the orphans & other admin work. Heavy rain here for the past week & most of the dams are full. The farmers big & small are very happy. Most people (even in the towns) plant their stand of maize, sweet potatoes, nyimo (Like a large chick pea that grows underground), & cassava. We think it will be a good crop this year. However, a lot of small scale farmers have grown tobacco hoping for a better return than for maize. We have not been able to plant on Ameva as the security is not good – all the fences taken & we are surrounded by hungry people. John wants to stick to cattle for the time being. A couple of weeks ago I mentioned James who was in ICU after a serious road accident. The week after he was moved to a ward, which was a real answer to prayer. John & Pastor James visited him this week - he is still weak but in good spirits. He has had three ops for a damaged liver so please continue to pray for his complete recovery. Paul & Les Evans visited this weekend & Paul preached at the morning service. The service actually lasted three hours! But it was a wonderful time & the word preached was so powerful. Many were convicted that their lives were not right & we are praying that there will be a big change among the members in 2014. It is amazing what a difference one person can make. Mr Agrippa, a retired government agricultural officer, used to come & check the cattle for John about once a week but now we have taken him on full time. He is such a reliable person & the other cattle men respect him – it seems like a great load has been taken off our shoulders. Things are being done that John has been trying to get done for a long time - the feed store is tidy, the fences are being mended, the cattle are going out to graze early. There seems to be light at the end of the tunnel. Zimbabweans are tightening their belts for more hard economic times this year. After the elections a lot of money left the country; after the New Year many firms have not reopened. In the church members were saying their jobs are in jeopardy. Nevertheless there was a great time of rejoicing this morning as our Hope & Trust is in Him Who is Greater. Please pray for James, son of a church member, Mrs Madondo. He was involved in a serious car accident before Christmas. Although much improved he is still in ICU. He is a student who came to the church when home. Thanks for the Christmas cards & e-cards & newsletters. After the holidays, being away from the technology, we now have 141 e-mails in our inbox some of which we haven’t managed to read yet so please forgive me (Celia) for not answering – I may not manage to answer everyone personally. If there is something urgent I haven’t replied to please email me again. We had a wonderful Christmas on the beach – sand, sea & sun – it was idyllic! Unfortunately the journey was not so good. Political unrest in Moz meant an alternative route. South of Zimbabwe to Gonarezhou national park; then across Mozambique to Vilanculos & on to Inhambane. (3 days) The road for about 400 km was little more than a farm track & took us 12 hours from the border to Vilanculos. It was so awful; we decided to risk being shot at & come back with the convoy on the coastal road. It turned out that the danger was not snipers but large vehicles – we were twice nearly back-ended. However, arrived home safely (2 days) & gave thanks to God. The time seems to have gone very quickly. Looking forward for months to being with our family, now only Abi is with us & she returns tomorrow! I try not to think about it. The schools open on Tuesday – it will be back to work as usual.